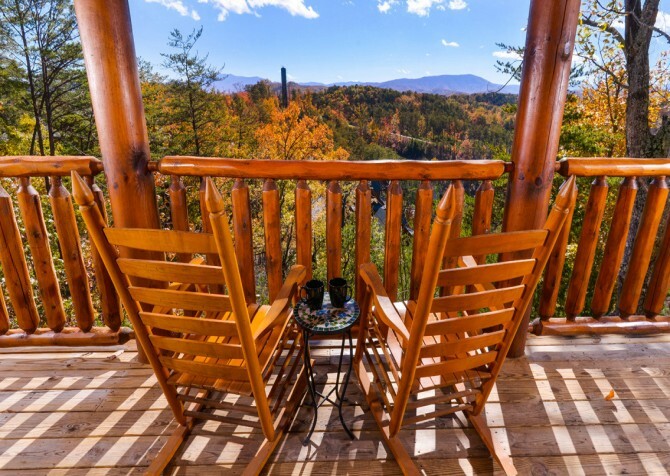 Plan to spend some time on your rocking chair porch at Paradise Peak, where you’ll find some of the best mountain views in the area. Inside the cabin, enjoy a spacious, open-concept layout with a game-equipped loft, indoor theater, indoor pool with a waterfall, and so much more. This 20-person cabin with more than 4,000 square feet of space is a great choice for any large group gathering in Pigeon Forge. This beautiful cabin with 4 master suites offers a short drive to downtown without sacrificing amazing mountain views. Overlooking the city, you can soak in the hot tub, play pool and foosball, watch TV in bed, or whip up meals in your own kitchen before lounging in front of a big screen TV! It's a great place to call home after busy days exploring the Great Smoky Mountains and downtown! 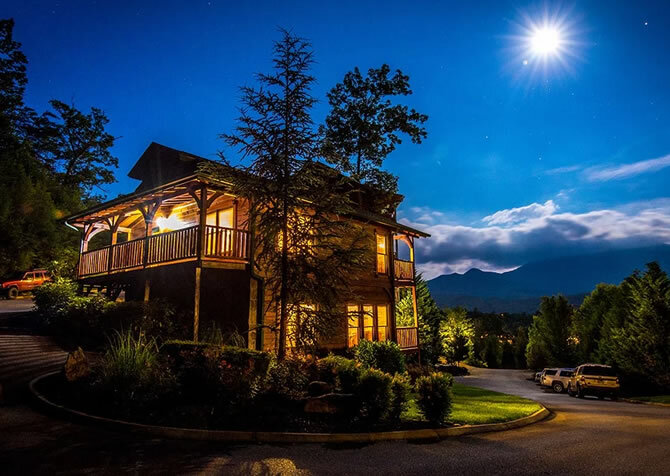 A luxurious and spacious lodge with city and mountain views, Gatlinburg Amazing Grace is perfect for group getaways. It boasts big screen TVs, bathrooms and fireplaces in every bedroom, beautiful decor, a rec room with pool table and arcade games, a fully equipped kitchen, and 10,000 square feet of space over 3 large stories. It's great for reunions, retreats, and special occasions! A mere 5-minute drive from the hustle and bustle of downtown Pigeon Forge, It’s a Wonderful Life keeps you close to city attractions without losing the calming vibes of the mountains. Spend all day shopping for souvenirs, exploring local museums, and riding fun rides. 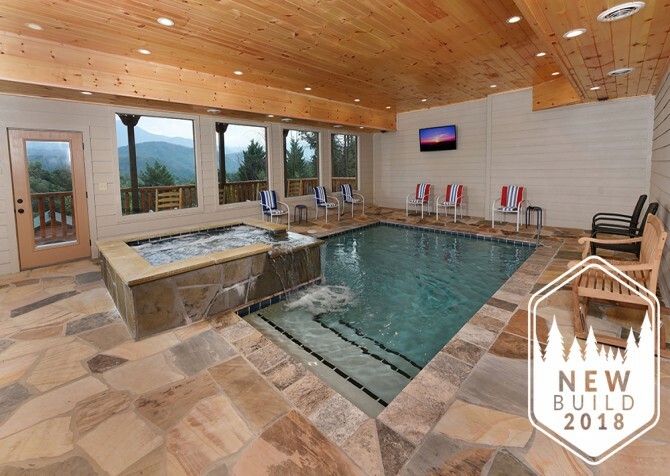 Return to the cabin for hot tub soaks, rec room tournaments, and spa night in the jetted tub! A beautiful 2-bedroom +loft retreat in Pigeon Forge, Be Our Guest welcomes you to relax, play, and enjoy your time in the Smokies. Play pool or foosball and watch ball games on the big screen TV, rest in the spacious bedrooms with their own TVs, or take in the mountain views from the decks. Or head into downtown to eat, shop, and play at the dozens of exciting attractions for all ages! 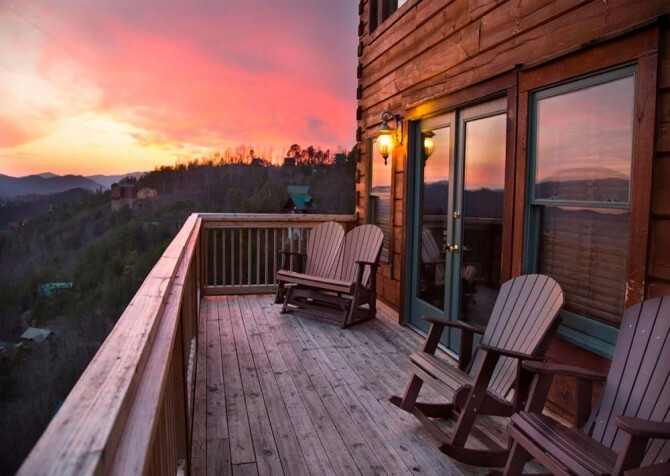 Boasting the best amenities of a Smoky Mountain cabin, Beaver's Mountain Top Retreat is ideal for getaways with friends and family. Enjoy the indoor pool, home theater, pool access, washer and dryer, five TVs throughout the cabin, indoor jetted tub, and more! 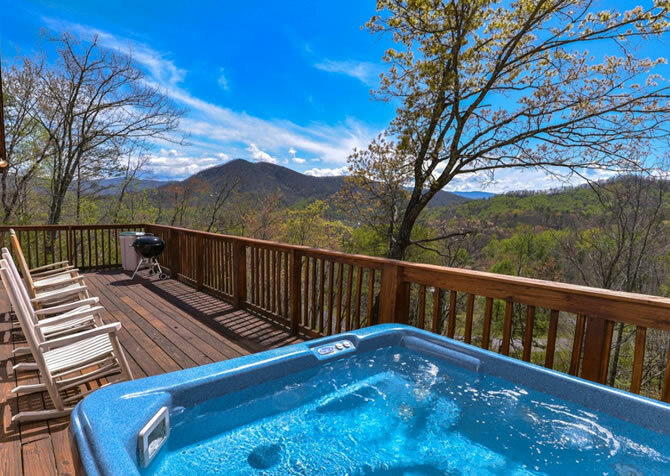 You'll also love the outdoor hot tub, paved parking and driveway, and rocking chairs for relaxing while you take in the mountain views. With a spacious layout, High-Bear-Nation provides plenty of room for 2 to 4 guests vacationing to Pigeon Forge. 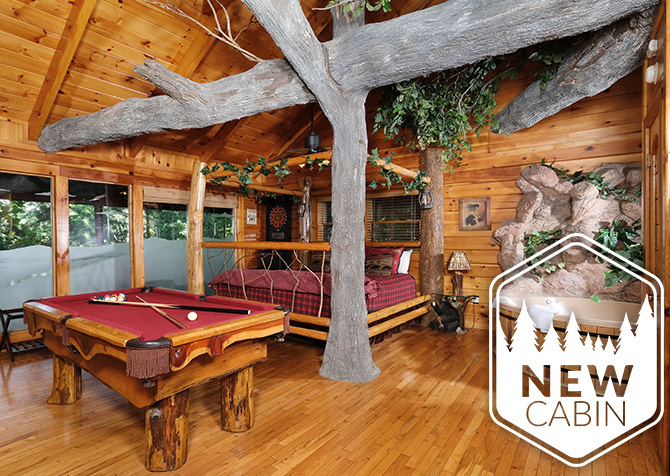 Inside the traditionally decorated cabin, enjoy an air hockey table, indoor jetted tub, movie library, and more. Outside, relax in front of mountain views with multiple levels of covered porch space. Enjoy all this plus pool access with less than a 4-mile drive to downtown at High-Bear Nation. A Splashtastic View features 4 cozy bedrooms, a laid-back cabin feel, a rec room with pool table and arcade game, and fire pit where you can roast marshmallows and relax at the end of a long day playing downtown. It also offers a long list of conveniences, including Wi-Fi, a Blu-ray player, washer/dryer, and more! It's a cozy home away from home for fun and relaxation! 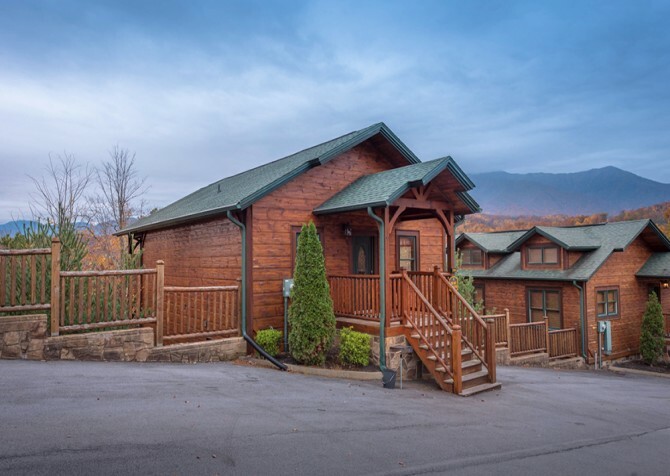 Located in the peaceful community of Bear Creek Crossing Resort under 6 miles from downtown Pigeon Forge, this amenity-packed 2-bedroom cabin will make you fall in love with Smoky Mountain living. Play games, relax in the hot tub, splash around in the community pool, and more! 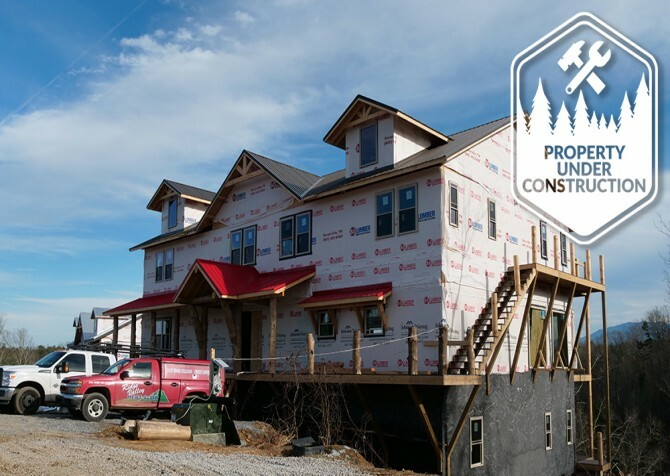 American Pride gives you everything you need for a comfortable and relaxing stay in the Smoky Mountains while also allowing you to enjoy extra perks like the community pool, covered picnic area, and nearby catch-and-release pond. At the cabin, you’ll have plenty of space to spread out and enjoy your family and friends, with homey touches and entertaining amenities! 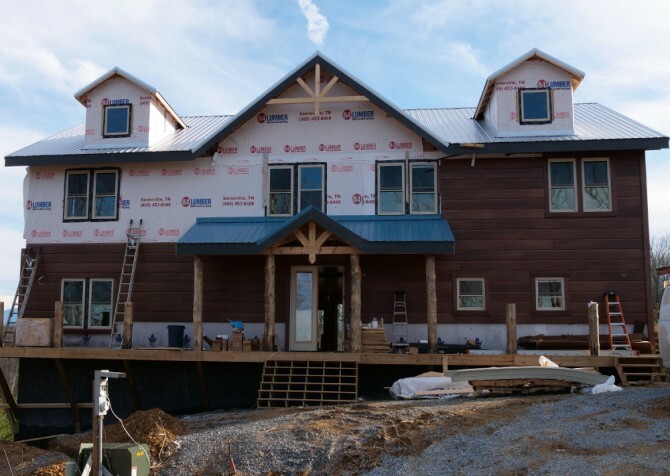 With 5 bedrooms, 5.5 bathrooms, a fully equipped kitchen, cozy indoor spaces, a rec loft with a pool table and an arcade unit, a private indoor pool, fun outdoor spaces, plus gorgeous mountain views, The Appalachian has it all — including a convenient location at less than 9 miles from town attractions, restaurants, and shopping centers. Located in Legacy Mountain Resort, this beautiful 2-bedroom, 2-bathroom pet-friendly cabin for 10 features stunning mountain views, comfortable interiors, an outdoor hot tub with a TV, and Wi-Fi to make stays more convenient. Both bedrooms boast king-size beds, and the fully equipped kitchen is ready for any recipe. Plus, the rec room comes with an arcade unit, a pool table, and an air hockey table! Fit for honeymooners, couples planning a romantic getaway, a few friends, and small families, this modern mountain cabins offers private mountain views, tons of large windows to enjoy them from, a covered back porch with an outdoor hot tub, and a motorcycle-friendly driveway for easy arrivals. Inside, you'll find a full kitchen, a game/theater room for hours of fun, and cozy spaces to unwind. A mere 2-mile drive from downtown Gatlinburg, Big Bear Views Lodge offers up to 22 guests a game-filled rec room, private home theater, 5 bedrooms with electric fireplaces and flatscreen TVs, 5 full bathrooms, and spacious decks with rocking chairs, a hot tub with an outdoor TV, and spectacular views of the Smoky Mountains as well as the twinkling city lights! 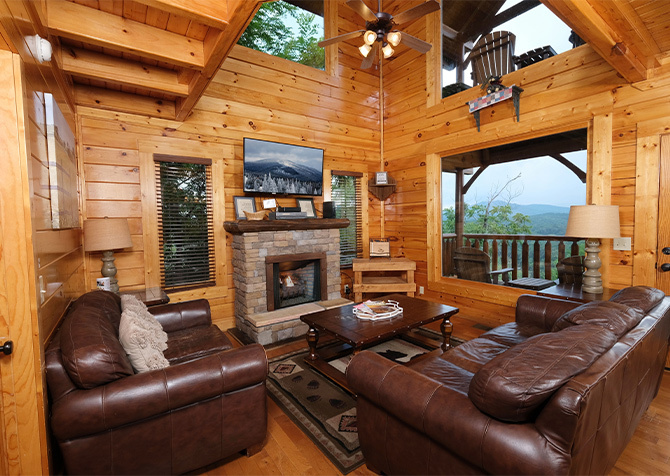 Bring your family and friends on a relaxing vacation to the mountains at Smoky View on the Rocks, a charming 2-floor, 2-bedroom, 2-bathroom cabin in Pigeon Forge. 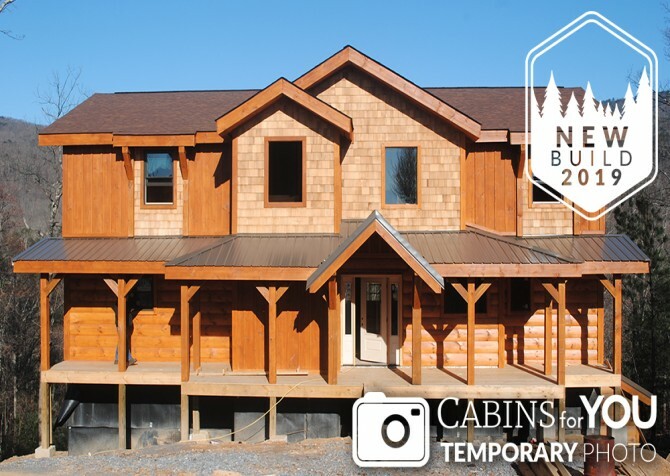 Sleeping up to 8 people, this entertaining cabin features a fun rec room, fully equipped kitchen, big screen TV, outdoor hot tub, gas fireplace, and mountain views to live for! 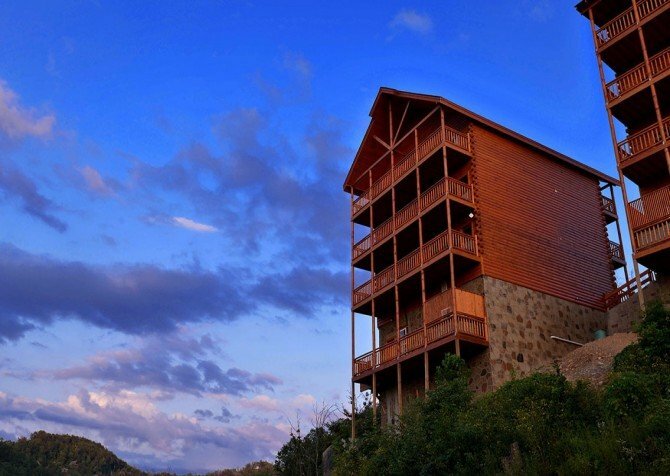 A short drive to downtown attractions in Gatlinburg is only the first reason to stay at The Best Cabin Ever! 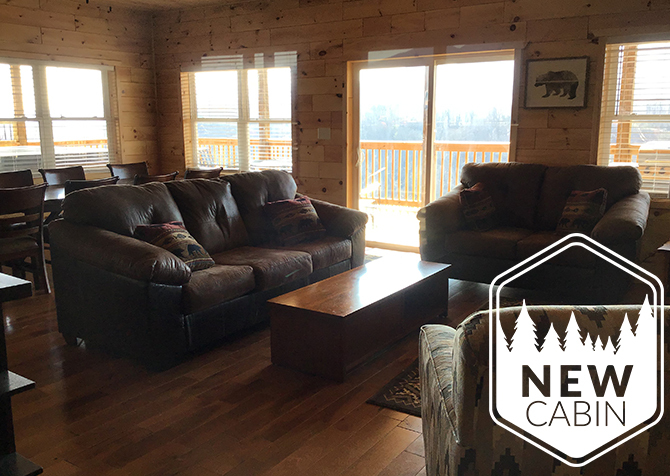 This 2-bedroom, 2-bathroom cabin rental for 8 boasts game tables and arcade units in the rec room, flatscreen TVs and king-size beds in the bedrooms, lovely mountain views, a steamy hot tub outdoors, free Wi-Fi, and so much more. 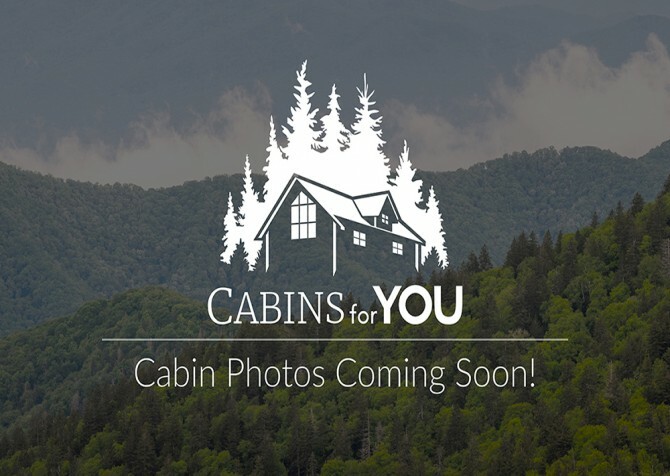 A great Smoky Mountain getaway for a large family or group of friends, this pet-friendly cabin boasts wooded views, an open floor plan, fun outdoor spaces, and surprise amenities throughout! From soaking in the outdoor hot tub and warming yourself by the electric fireplace to popping your favorite film in the DVD player and playing games all night on the Wii, boredom will be a thing of the past. This pet-friendly Pigeon Forge cabin offers 2 bedrooms and 2 bathrooms for families and friends. Situated in the Bear Creek Crossing Resort, you will enjoy the pool access this place has to offer - great for summer days. Soothe your worries and pamper yourself in your sauna or play a few rounds on the air hockey, foosball or pool tables for a fun family game night. Nestled on the mountainside in Pigeon Forge, this picturesque Smoky Mountain cabin is peaceful and quiet. A semi-private location allows you to truly relax, while amenities such as a foosball table, grill, flatscreen TV, and pool table provide you with fun and entertainment. 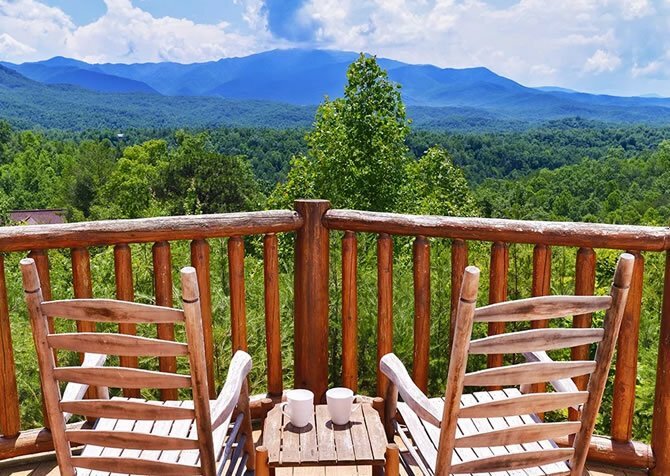 Soak in your mountain view from the comfort of the wooden deck furniture, enjoy a coffee as you prepare for the day, and head into town to eat, shop, and check out top attractions! Just a few miles from the heart of Pigeon Forge, this pet-friendly 4-bedroom, 4-bathroom home away from home boasts an outdoor hot tub overlooking a scenic mountain range, a rec room filled with games, a TV in every bedroom, 4 jetted tubs, 3 king-size beds, rocking chairs on all 3 decks, and more — if you can believe it! 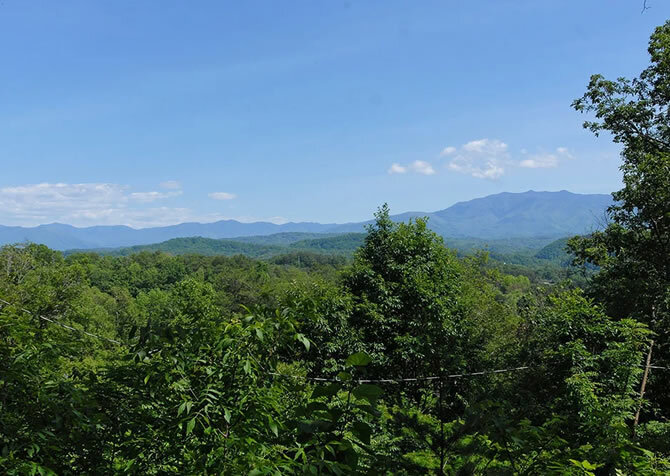 Nestled on its own 1-acre lot of mountain forestry, Once Upon A View boasts incredible views unobstructed by city lights and buildings in the peace of a gated community in Pigeon Forge. If you’re seeking an escape from the everyday, Peak a View is for YOU! Perfectly cozy for couples, a small family, or a few friends, this 1-bedroom, 1-bathroom cabin sleeps 4 with king and queen beds. 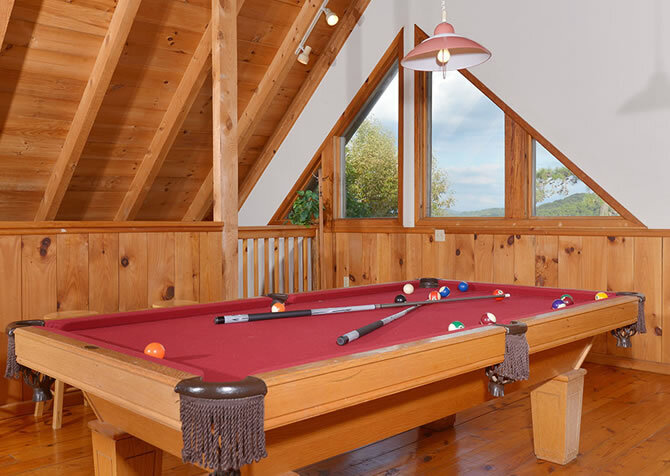 In the loft, shoot some pool with truly incredible mountain views and keep everyone entertained with high-speed wireless internet, a big screen TV, a DVD player, and an outdoor hot tub! 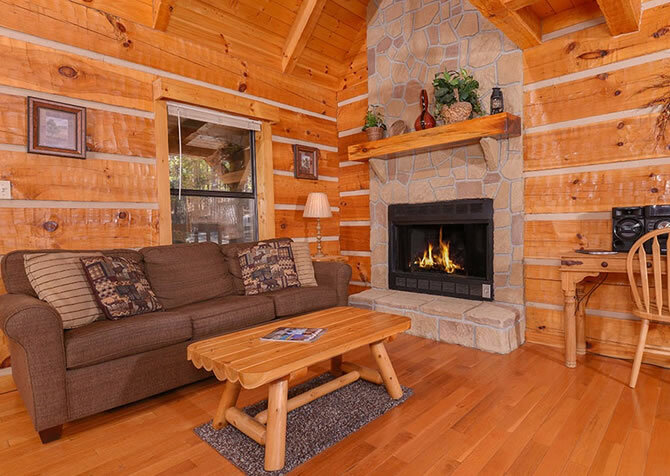 Highland Plunge is an unforgettable family-friendly cabin that can accommodate up to 10 guests. This property stands out with a private indoor pool and a theater room with a 70-inch flatscreen! Extra amenities include TVs in every bedroom, a shuffleboard table, 2 Blu-ray players, high-speed wireless internet, and a hot tub! To top it off, Highland Plunge has community pool access! 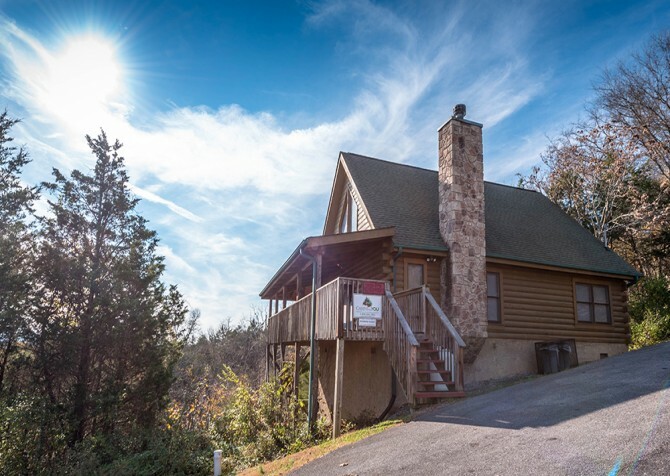 You’ll be surrounded by Smoky Mountain views and only a little over 8 miles from downtown Pigeon Forge at Mother’s Dream, a small group cabin with plenty of space and indoor private pool! 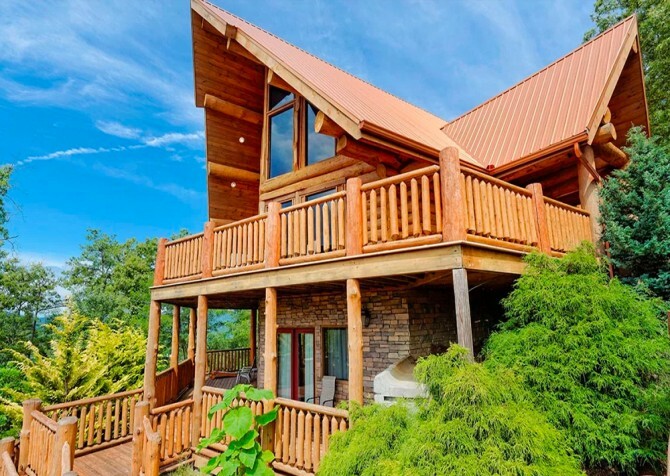 Set in the scenic Smoky Mountains, this beautiful 4-bedroom Pigeon Forge cabin features amazing views of the mountains along with entertaining features both inside and outside the cabin. 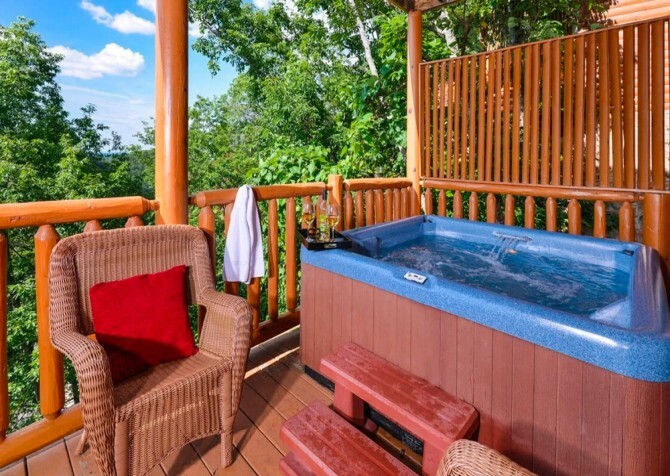 From a private indoor pool and private home theater to an outdoor hot tub and a sauna, you’ll find plenty of ways to relax and have fun with family and friends at Beaver’s Treehouse. In between trips to downtown Pigeon Forge, use cabin downtime to shoot some pool or play air hockey in the rec room with friends, play the kids’ favorite movies from home on the large flatscreen TV in the media room, and enjoy cold drinks while seated around the deck’s dining table with breathtaking mountain views. 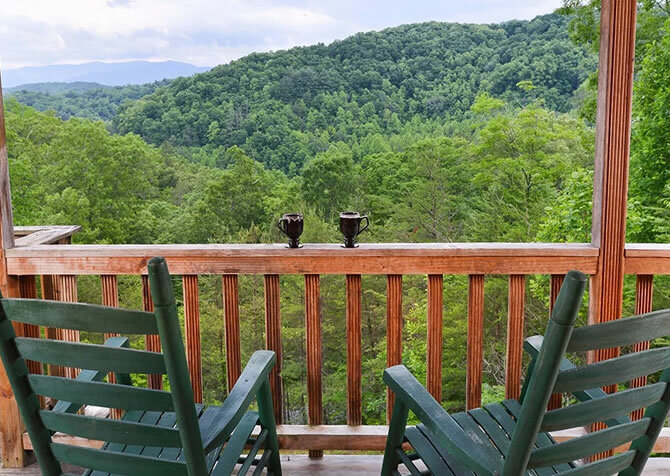 Almost an equal distance from Pigeon Forge and Gatlinburg, the pet-friendly Black Bear Ridge offers the quiet atmosphere of the Smoky Mountains while placing you between 2 of the most exciting cities in East Tennessee. 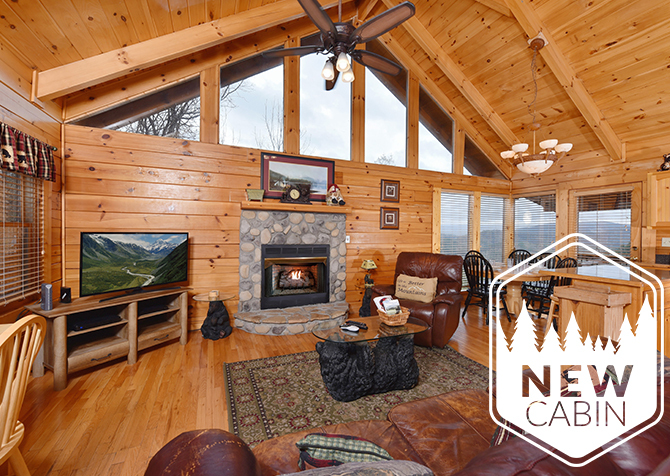 Spend days hiking, checking out attractions, eating, and shopping before heading back to this cozy escape with game tables, a huge flatscreen TV, an outdoor hot tub, and multiple indoor jetted tubs. 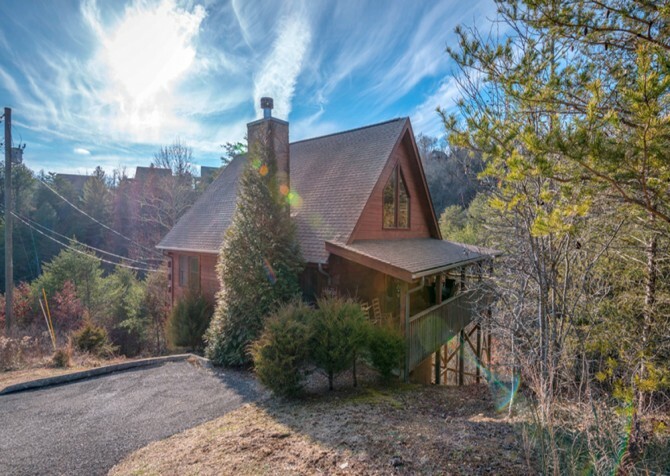 Sometimes it's hard to find a cabin that offers everything that your group desires – but not with this 6-bedroom cabin in Gatlinburg! 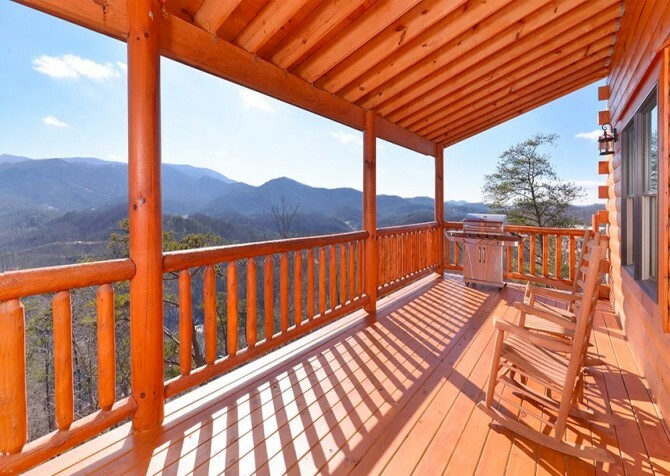 With space for 22 guests, this Gatlinburg cabin features a fantastic view of the Great Smoky Mountains National Park from the expansive decks. Pet friendly, this cabin also boasts a luxurious kitchen with gorgeous counters, a log interior, pool table, and a hot tub for unwinding after long days. It’s all in the details at the 3-bedroom Angel Haven in Sherwood Forest, and the details are impressive! 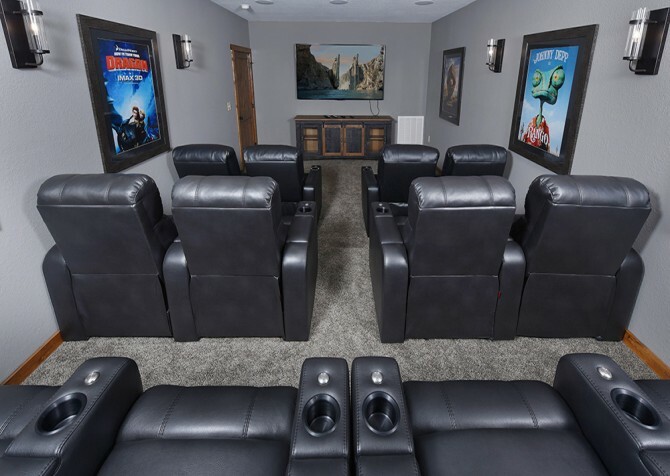 Swim in your private indoor pool, watch movies with theater-style seats and a 4K 3D home theater system with full 5.1 surround sound and a 4K Blu-ray player, watch 4K TV in bed, take advantage of high-speed Wi-Fi, play pool, air hockey, arcade games, and a 4K Xbox One S, and so much more! Spend days at Smoky Mountain Manor soaking in the hot tubs with TVs, soaking up sun on the deck by the private indoor pool, playing arcade games and pool in your game room, relaxing in front of the story-and-a-half outdoor wood-burning fireplace, watching movies in your private theater room, having cookouts at the outdoor kitchen area, enjoying views of Mt. LeConte and beyond, and more! Good times await you at Serenity, a Pigeon Forge cabin near some of the most popular attractions in town yet secluded enough for a personal experience with nature. Enjoy your morning coffee on the back deck and head to town within minutes to check out the local scene. Chow down on Southern cuisine, shop 'til you drop, ride roller coasters for a fun day, and more! Only a short drive to Pigeon Forge, Owlpine Lodge sleeps 12 and boasts 3 cozy bedrooms, 4 full bathrooms, a fully equipped kitchen, media space with projector, rec loft with games, screened-in deck with a steamy hot tub, charcoal and gas grills, a washer and dryer set, plus FREE Wi-Fi to keep you and yours comfy and entertained throughout your stay! 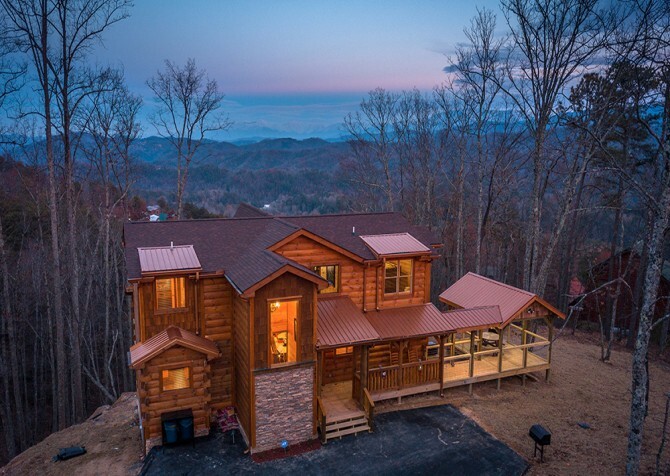 A luxurious escape in Pigeon Forge, this 2-bedroom, 2-bathroom cabin boasts gorgeous Smoky Mountain views, a home theater with a projection screen, a rec room with a pool table, a TV in every bedroom, an outdoor hot tub, and more! 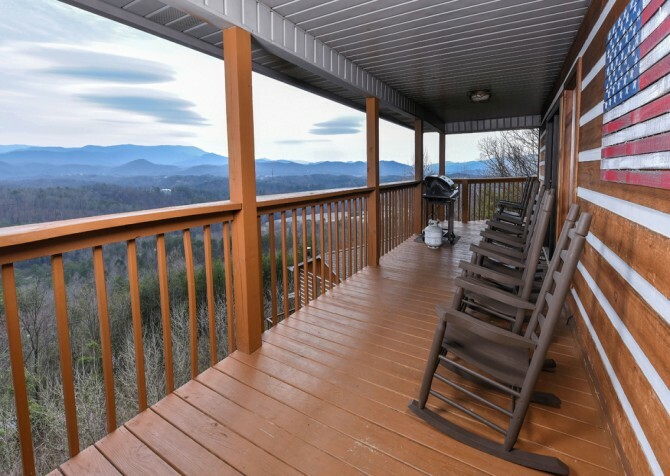 Spend your morning on the back deck overlooking the mountains, savor the afternoon with a game of air hockey, and cook an evening meal in the fully equipped kitchen. 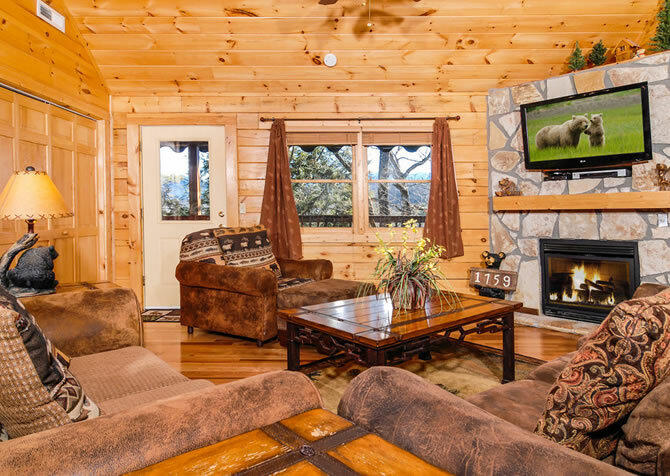 With 3 bedrooms and room for 12 guests, Mountain Getaway and a Theater is perfect for small group getaways or fun family vacations. It's pet friendly and features lovely mountain views, a hot tub with a TV, high-speed Wi-Fi, a grill, arcade games, and pool, air hockey, and foosball tables for hours of fun. It also boasts access to community amenities! 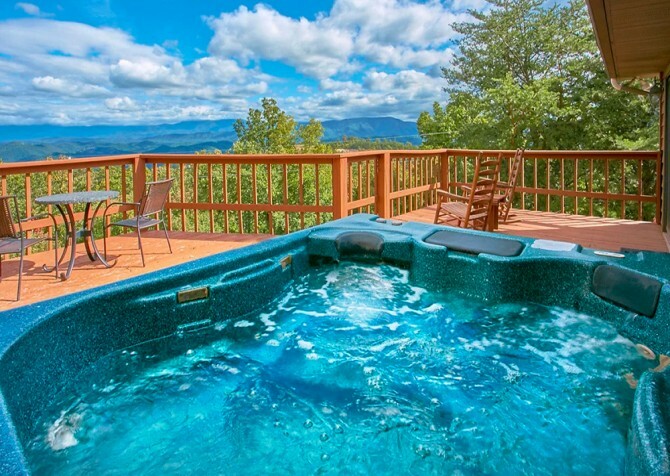 Boasting beautiful Smoky Mountain views from the decks, pet-friendly Deer Leap offers luxury all around. Enjoy stylish décor, comfortable furnishings, a home theater with leather seating, a fully equipped kitchen with stainless steel appliances, a dining room with mountain views, and living spaces that are great for groups. For fun, check out the pool table, foosball table, poker table, or air hockey table! With 12 bedrooms, 10 king-size beds, 2 stainless-steel refrigerators, 2 rec areas with plenty of fun games, a theater room with a flatscreen TV, a private indoor pool, and a covered outdoor hot tub, Luxury Lodge was made for large groups! 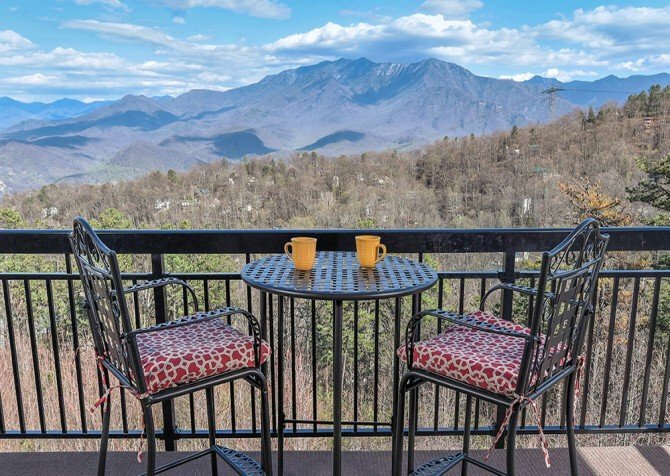 Only 3 miles to the heart of Gatlinburg – in the Gatlinburg Falls Hidden Valley Resort – Views Above the Rest brings you mountain views while keeping you close to local attractions. 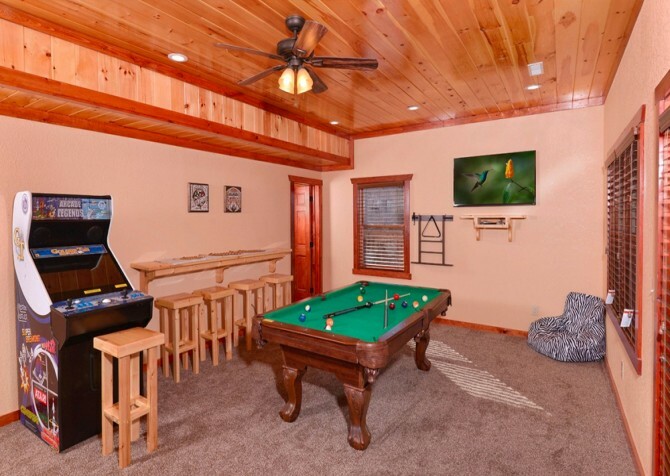 After a day of dining, shopping, playing, and exploring downtown, head back to the cabin for a fun game tournament in the rec room, relaxing hot tub soak on the spacious deck, and exciting move night with the 75-inch HD Smart TV! Nestled in the beautiful Sherwood Forest, LeConte Bear Plunge is ideal for family get-togethers and other large group vacations. 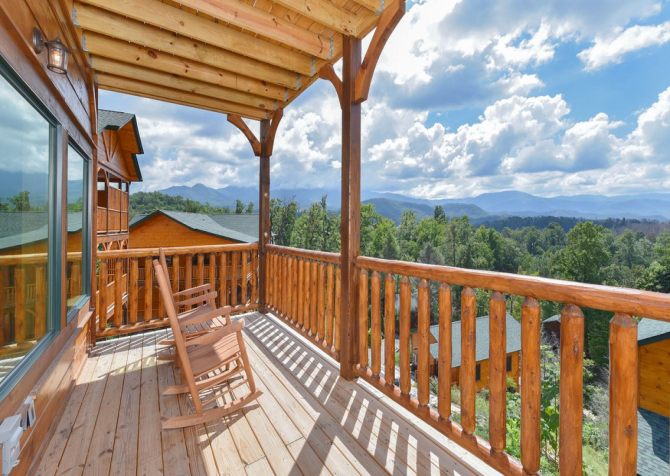 You’ll love this cabin’s entertaining extras, relaxing amenities, and rocking chair porch with sweeping mountain views. And you’ll enjoy all this right around the corner from popular large group attractions, great restaurants, and a wide variety of shops in Pigeon Forge! 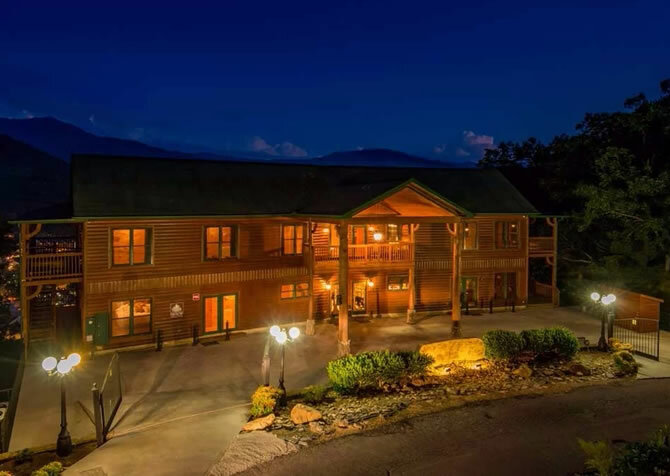 Just a few miles from downtown Pigeon Forge but quietly tucked high on a mountain ridge, Camp David is your serene mountain cabin with incredible views, inviting bedrooms, and great amenities! Fairly close to downtown Pigeon Forge, Reindeer Bay is a spacious 3-level cabin with a view of Mt. LeConte and entertaining amenities everyone will enjoy. Cozy up by the fireplace in the living room, relax by the a fire pit bowl out back, and play arcade games in the rec spaces. Resting high above the tree lines, Mt. LeConte Views Lodge lends incredible views from 3 spacious decks and through the expansive windows facing the miles of rolling mountain peaks. 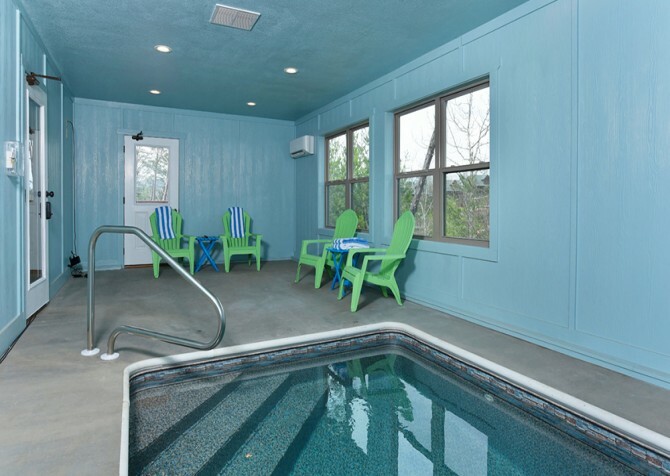 Spend relaxing days in the outdoor hot tub while watching TV on the deck’s flatscreen, shooting pool and playing foosball by the wetbar in the rec room, and lounging by the community pool. 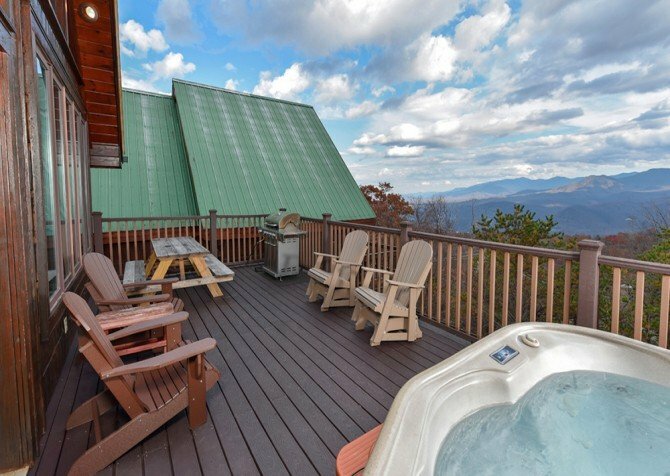 Take in your mountain view from the hot tub or porch swing of this 1-bedroom cabin rental. 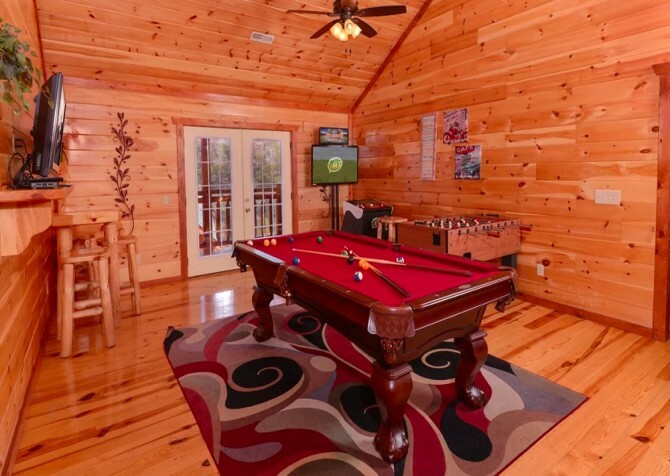 Located in Pigeon Forge, this cabin features a semi-private location, a rec room with air hockey and pool, a fully equipped kitchen, a gas fireplace for cool mountain nights, and amenities to make you feel at home. 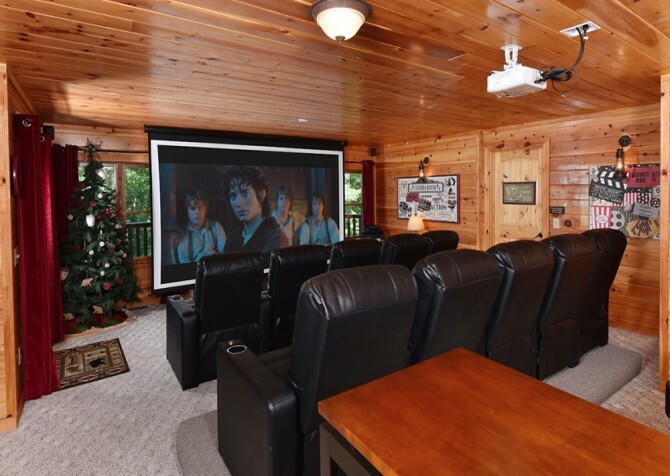 Nestled on a semi-private lot with sweeping views of the Smoky Mountains, this large-group cabin offers the best of entertaining amenities, including a variety of game tables, an outdoor hot tub, a mini bar, and a private theater room. Awesome Views Mountain Retreat also boasts large living spaces, huge windows to soak in the sights, and versatile sleeping spaces for guests. 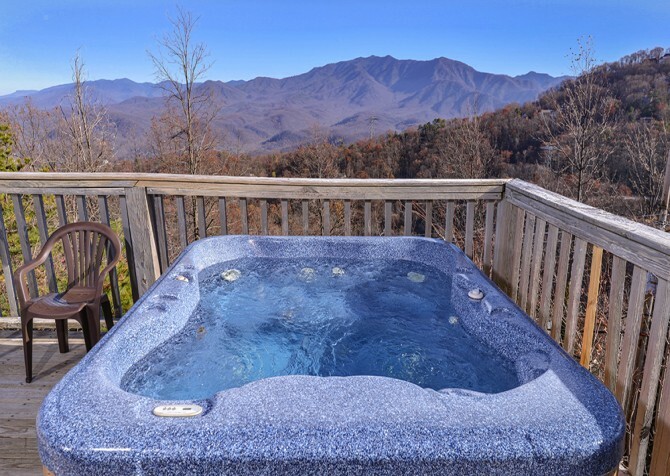 Nestled in Pigeon Forge, Lookout Lodge boasts beautiful mountain and wooded views, a spacious rec room with a big screen TV, an outdoor hot tub, and 4 indoor jetted tubs. Spend time in town at local attractions and shopping centers, then head to your vacation home to keep the good times rolling with barbecue parties, game tournaments, and movie nights! Relax in the homey atmosphere of Sky High with incredible views of Mt. LeConte right through your living room windows, less than 5 miles from historic downtown Gatlinburg! 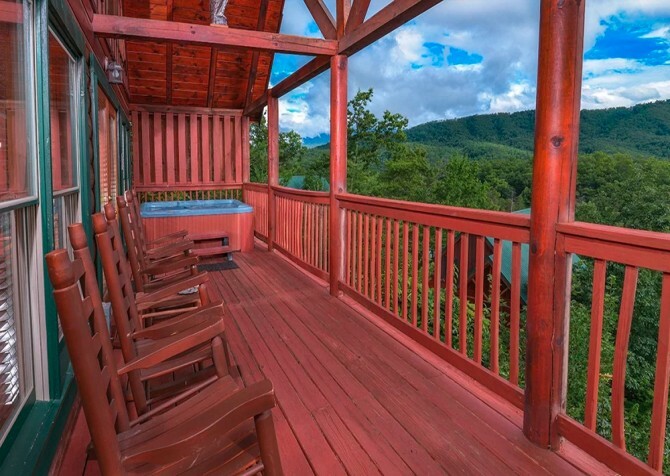 Less than 6 miles from the hustle and bustle of Pigeon Forge, Heavenly Daze are yours for the taking at this 3-bedroom, 2.5-bathroom cabin for 8 in the Smokies. 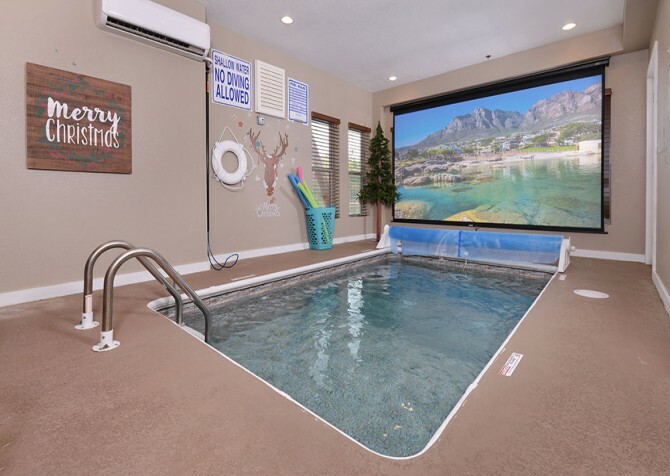 Play all day in town, then head to your vacation home for relaxing soaks in the hot tub, air hockey and foosball in the rec room, chocolate treats from the fully equipped kitchen, and film classics on the big screen TV. 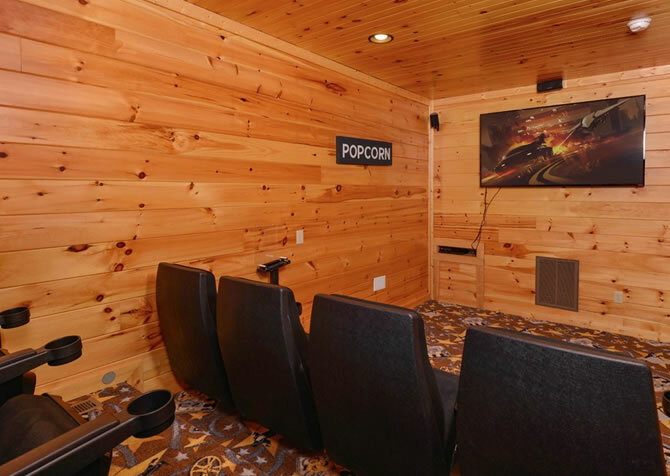 Located in the Gatlinburg Falls Resort, Unforgettable Views and a Theater is ideal for family vacations and small group getaways of up to 10 guests. 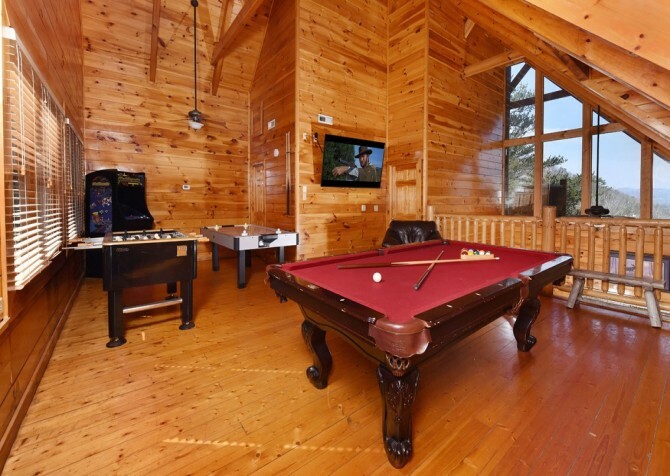 Minutes from downtown Gatlinburg, this pet-friendly cabin features a large rec room with multiple game tables and a big screen TV, community pool access, an outdoor hot tub, and gorgeous mountain views — perfect for your next vacation to the Smokies! With less than an 8-mile drive to downtown attractions, dining, and boutiques, A Walk in the Clouds is a great 2-bedroom escape for family and friends. Play arcade games in the loft, soak in the mountain views from the steamy hot tub, entertain the little ones with the big screen TV, sip coffee by the stone fireplace, and head to dreamland in a king-size bed. Spend your days soaking in incredible views of Mt. 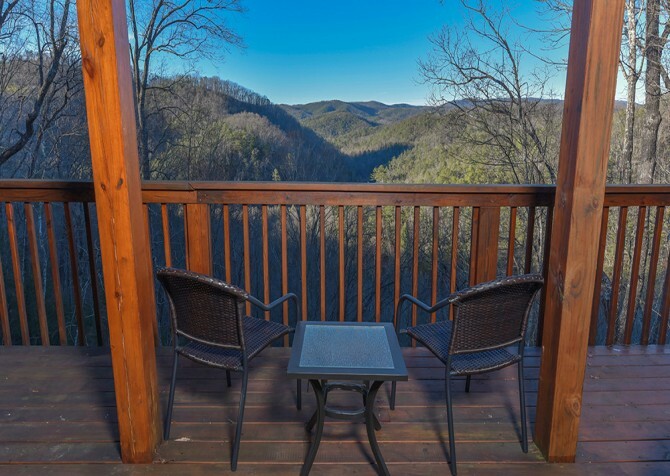 Leconte from your open-air balcony outside the master bedroom or while relaxing in the outdoor hot tub before hitting the town in nearby Pigeon Forge. 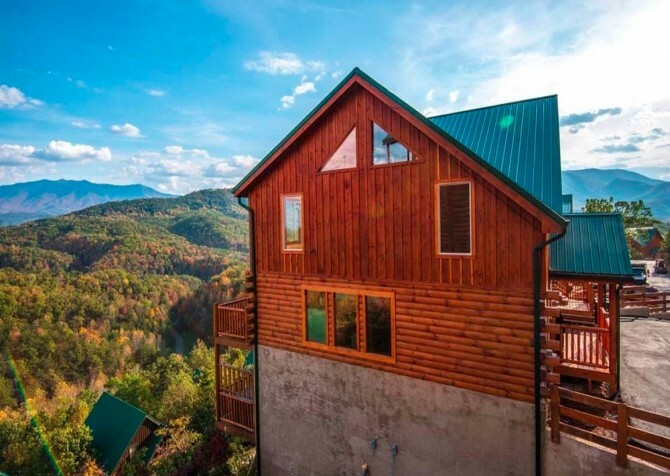 Less than 3 miles from downtown Gatlinburg, Splash ‘N Views is a 4-bedroom, 5-bathroom cabin for 12 in Gatlinburg Falls Hidden Valley Resort, great for family vacations or trips with friends. Play, dine, and shop in town, then head back to the cabin for move nights on the big screen TVs, soothing soaks in the hot tub, and splashes in the private indoor pool! A mere hop, skip, and a jump from downtown Pigeon Forge awaits the Edge of Paradise. 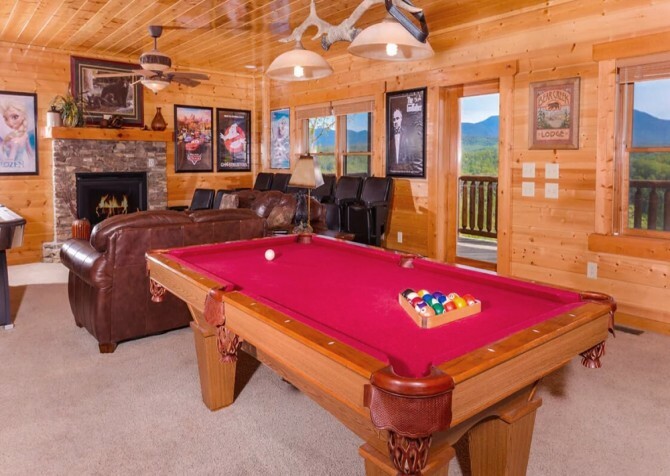 Featuring a gorgeous mountain view, fun pool table, outdoor hot tub, and an indoor private pool, this Smoky Mountain cabin provides an entertaining escape, keeping in-town attractions and restaurants close for comfort. Located in Black Bear Ridge Resort, Loose Moose provides community pool access, multiple deck spaces, 2 hot tubs, 3 fireplaces, 6 king-size beds, 7 indoor jetted tubs, a private home theater, an indoor elevator, and plenty more amenities — all within reach of the local attractions, restaurants, shops, and outdoor activities of Pigeon Forge! Groups of up to 38 guests can find all the comforts of home and plenty of extravagant extras at Splash Mansion. 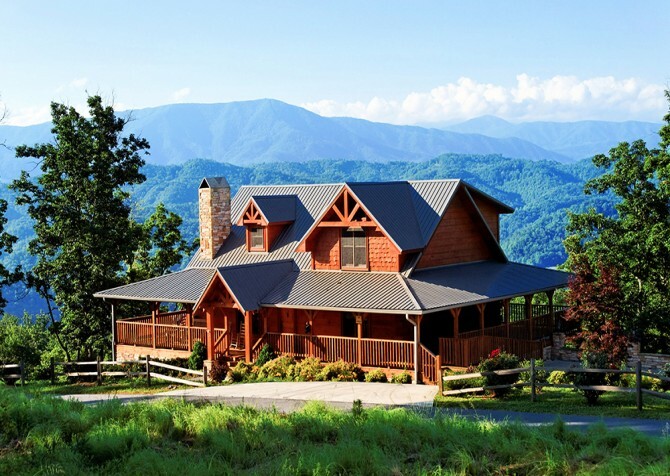 With 11 bedrooms and 11 ½ bathrooms, this cabin was designed to accommodate retreats and reunions in the Smokies. 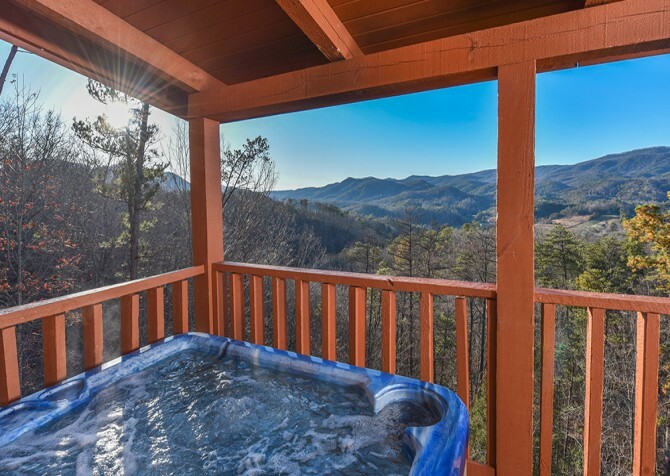 Enjoy secluded mountain views with a less than 7-mile drive to downtown Pigeon Forge at this fully loaded cabin, complete with a private indoor pool, 2 outdoor hot tubs, and more! Less than 3 miles to the heart and soul of Gatlinburg, Majestic View offers a close location to downtown fun with awesome amenities to boot! 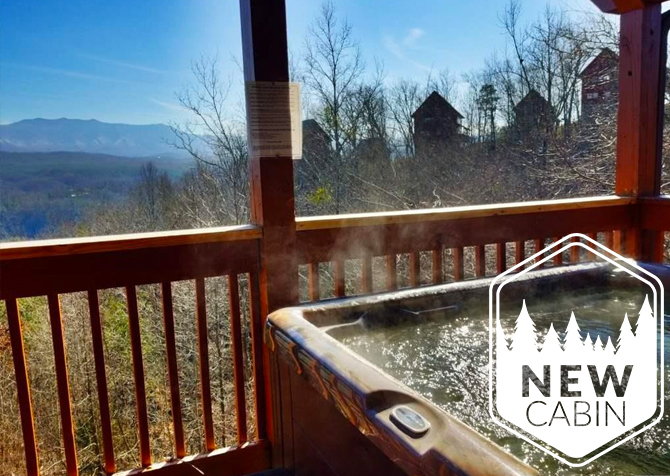 Soak in the outdoor hot tub after hiking the national park, cozy up by the stacked-stone fireplace, play pool for hours on end in the rec room, and snuggle in a king-size bed every night. 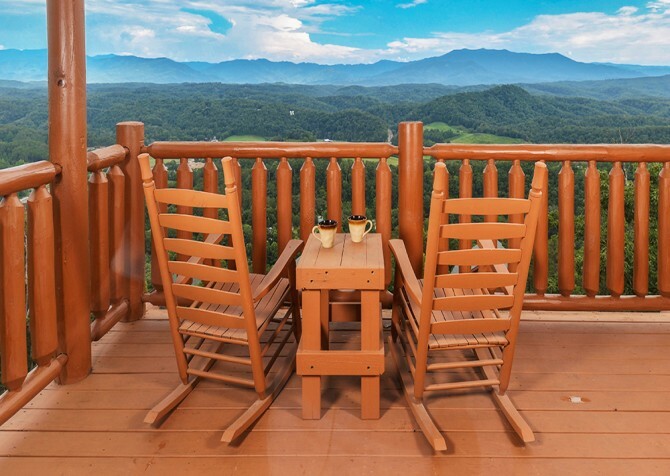 Mere miles away from the middle of downtown Pigeon Forge, Black Bear Ridge Mountain Views brings you closer to nature while keeping you within easy driving distance to tasty restaurants, fun attractions, and outdoor activities. 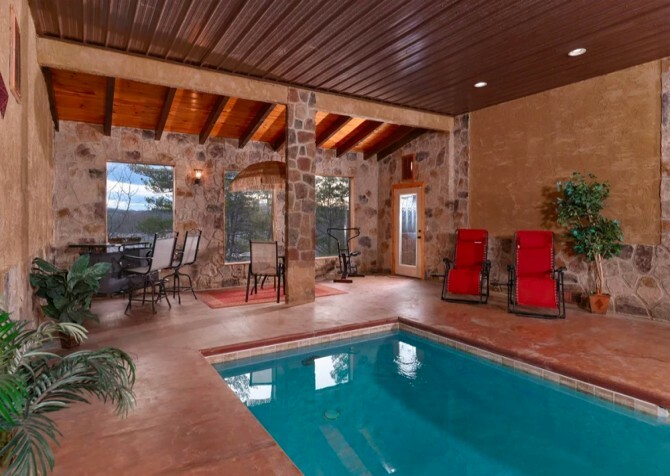 With 4 bedrooms, 3 bathrooms, a home theater, game loft, and 2 decks with gorgeous mountain views, keep up to 14 guests in comfort and awe at this luxury abode. If you love local art and handmade work, visit the Great Smoky Arts & Crafts Community just 10 miles from this 2-bedroom, 2-bathroom cabin. 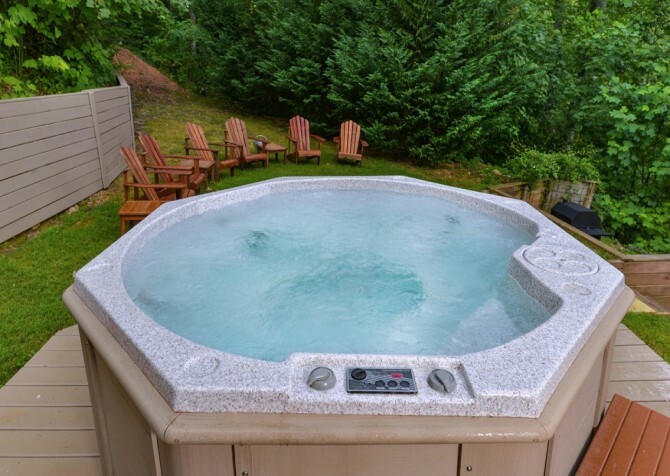 Along with a secluded location, Mountain Paradise offers an outdoor hot tub, rocking chairs, and 4 HDTVs! A flat driveway makes unpacking a breeze, and high-speed internet is a nice convenience. 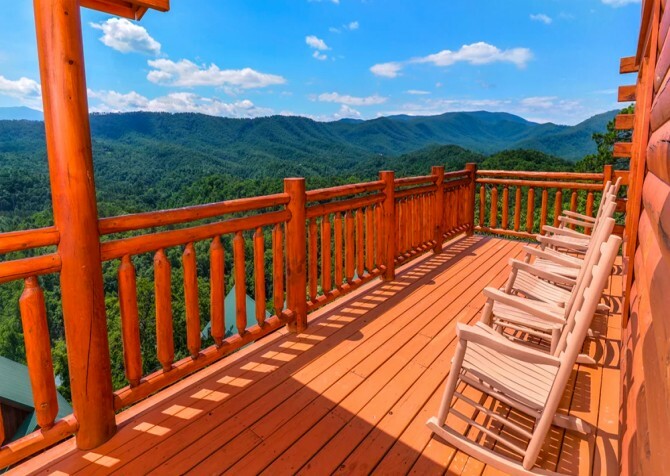 For amazing views of the Smoky Mountains with a short drive to downtown Pigeon Forge, make plans to stay at The Deck House during your next visit to East Tennessee. This 4-bedroom cabin features sleeping space for up to 13 guests, making it ideal for family vacations and small group getaways. Enjoy entertaining options like a pool table, rec room, and outdoor hot tub as well as a wraparound covered porch. 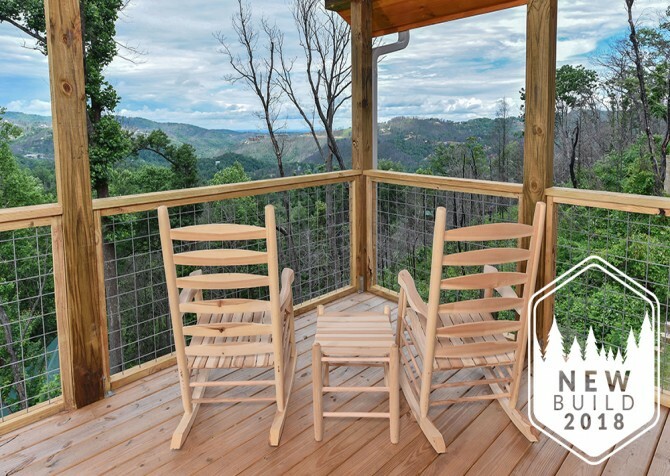 The breathtaking views from the back porch of this 2-bedroom, 2-bathroom cabin will make this cabin live up to its name! 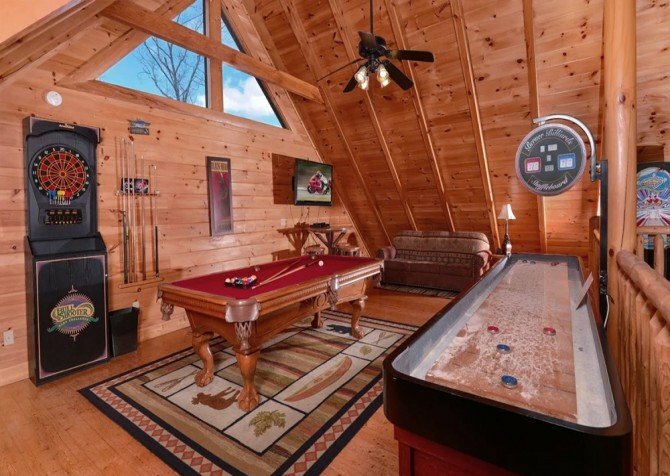 Spend quality time in front of the large stone fireplace or shoot some pool together in the loft game room. 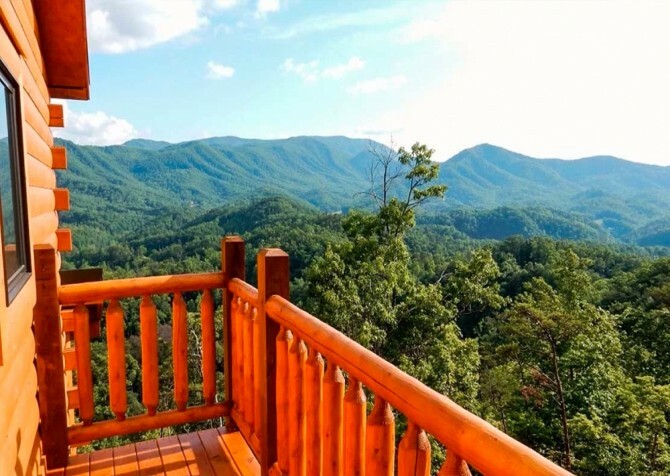 Within a convenient drive to Pigeon Forge, you will love coming back to your rustic mountain cabin after a day of shopping, ziplining, and eating. 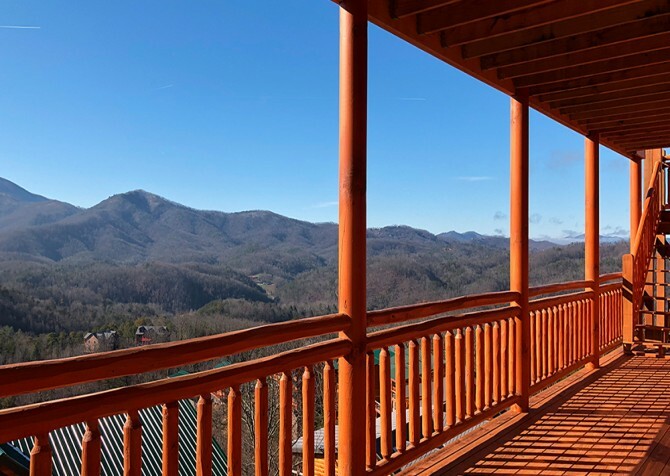 A wraparound porch with one-of-a-kind mountain views — can you have all this when bringing a large group to the Smokies? When you stay at Wild Turkey Lodge, you can! 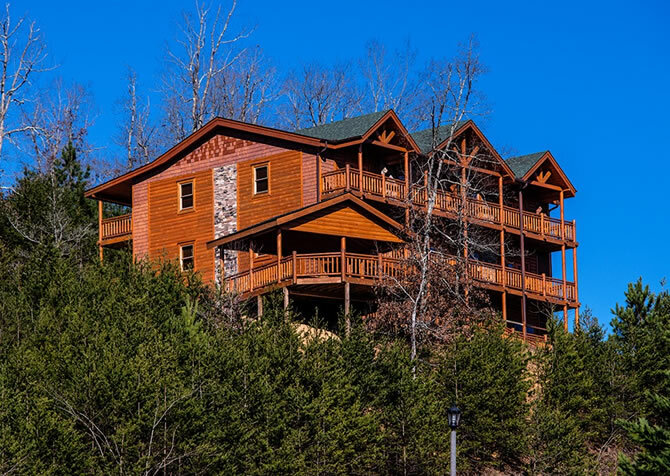 This 3-story cabin sleeps up to 24 guests and is convenient to the exciting attractions of Gatlinburg. So load up the caravan, and come on down to experience the great amenities and comforts of Wild Turkey Lodge! 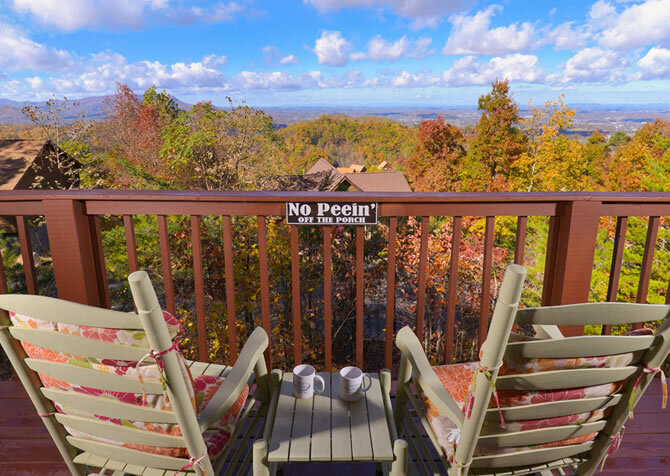 Views of God's Country is a truly unique pet-friendly 2-bedroom cabin in Pigeon Forge. 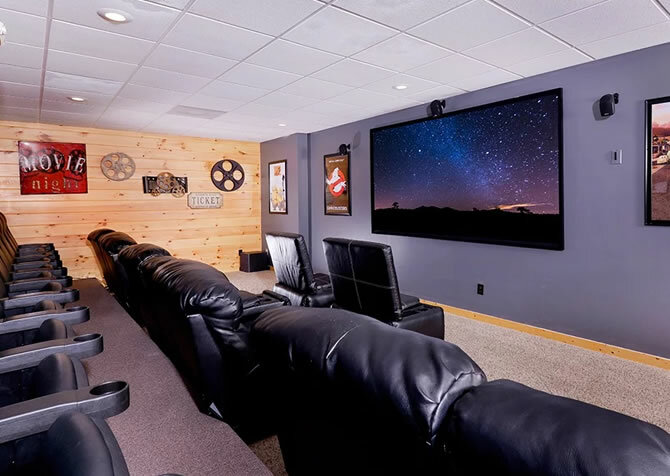 Play pool, arcade games, and air hockey in the rec room, watch movies on the 60-inch LED TV in the theater room, or cozy up by the fire in the living room. 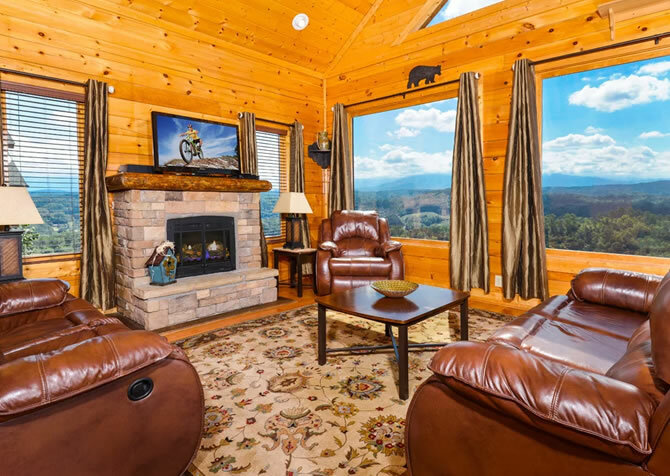 You can also soak in the mountain views from the decks, whip up meals in the full kitchen, or watch your favorite shows on one of the 6 flatscreen TVs! 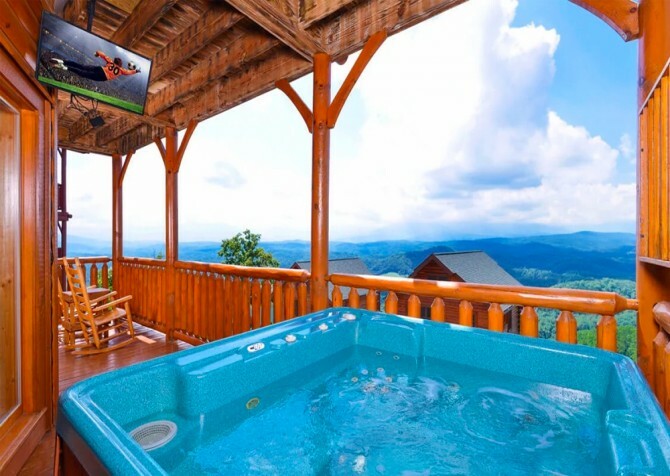 With pool access, an outdoor hot tub, a pool table, and a flatscreen TV, this 2-bedroom, 2-bathroom Pigeon Forge cabin is your ticket to fun and relaxation. 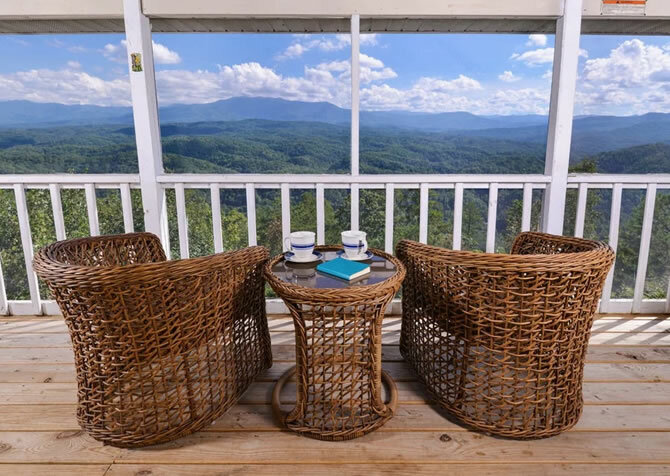 Sip coffee on the deck and enjoy the gorgeous Smoky Mountain views, prepare home-cooked meals in the kitchen, or fall asleep watching TV in bed. There's plenty of space outside on the wraparound porch, and the inside spaces are warm and cozy. 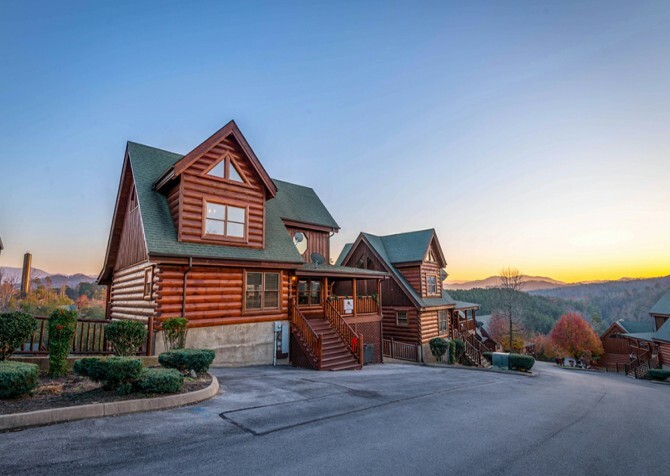 Families and friends will find entertainment and fun at this 7-bedroom (+2lofts), 7-bathroom cabin in Black Bear Ridge Resort in Pigeon Forge. 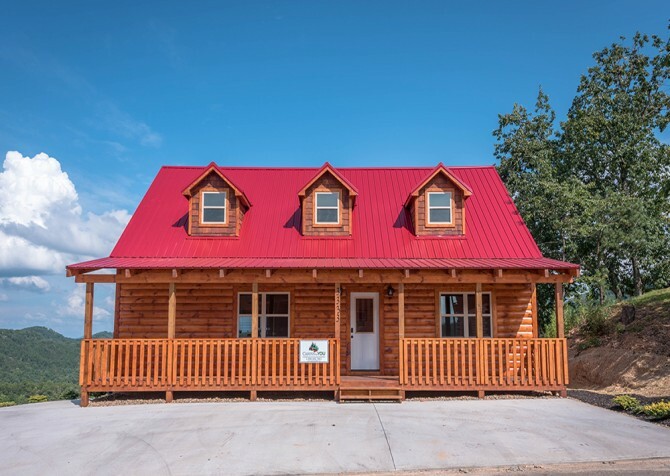 Along with community amenities, the cabin boasts amazing mountain views, a full kitchen with stainless steel appliances for easy in-cabin meals, bedrooms with their own jetted tubs and TVs, a private indoor pool, a theater room, and games! 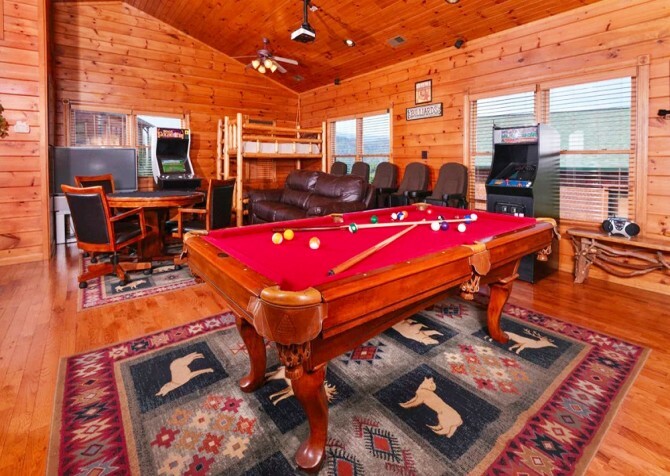 From air hockey and arcade games to a fully equipped kitchen and theater room, this 3-bedroom, 4-bathroom cabin just minutes from downtown Gatlinburg offers everything you need for a fun, convenient, and memorable getaway. Spend days playing at the cabin or head downtown for local events, fun group attractions, and great places to eat! In the cabin and downtown, there is always something to do. 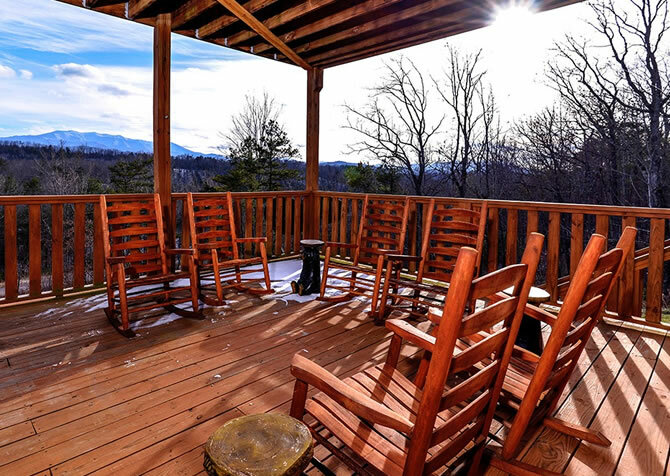 Living up to its name, this 3-bedroom, 2-bathroom cabin boasts fantastic views of the Great Smoky Mountains. Start your mornings with a cup of coffee at the bistro-style table on the deck as you take in the soaring blue-mountain views. Custom log work makes the cabin unique, and amenities such as a pool table, enclosed hot tub, air hockey table, and TVs make the cabin fun and relaxing. 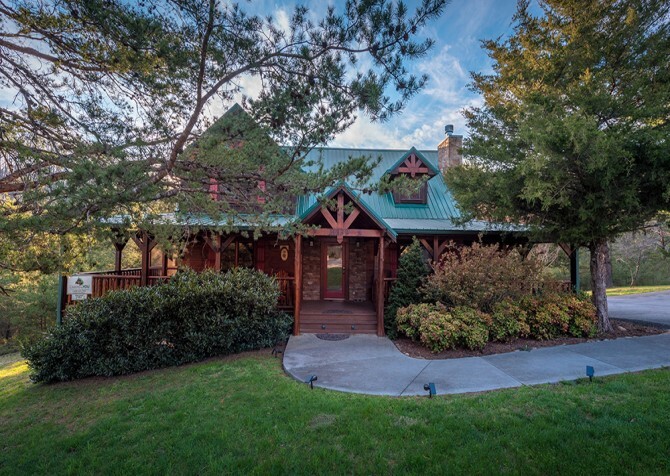 Featuring Smoky Mountain views, a stone fireplace, 2 big screen TVs, and a semi-private location in Pigeon Forge, A Li’l Bit of Heaven is just what your family vacation, trip with friends, or couples’ retreat needs! This 2-bedroom +loft, 3-bathroom cabin for 10 even offers homey conveniences, like free Wi-Fi, a washer and dryer, a hot tub, plus a fully equipped kitchen. Plan your next family vacation or couples’ retreat to Serenity’s Clear View. This 1-bedroom cabin, with its semi-private atmosphere, is also ideal for romantic getaways when you’re craving some solitude. Enjoy plenty of relaxing amenities, including an indoor jetted tub, private sauna, and outdoor hot tub. Other amenities include a game room, big screen TV, and charcoal grill. 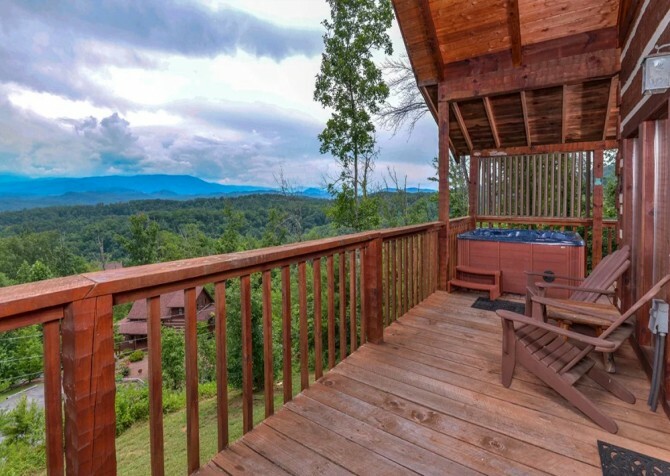 Conveniently located between Pigeon Forge and Gatlinburg, this charming and rustic 1-bedroom +loft cabin boasts Smoky Mountain views, a private hot tub, spacious interiors, a pool table, and comfortable furnishings. You'll feel at home curled up by the wood-burning fireplace and cooking in the fully-equipped kitchen. Sit outside on nice days and soak in the beautiful mountain views as you relax. 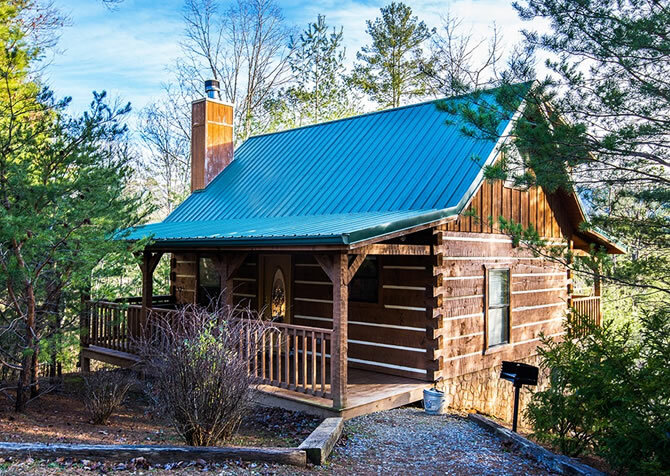 Just a short drive from the heart of downtown Pigeon Forge, this 1-bedroom, 2.5-bathroom cabin is convenient yet serene. 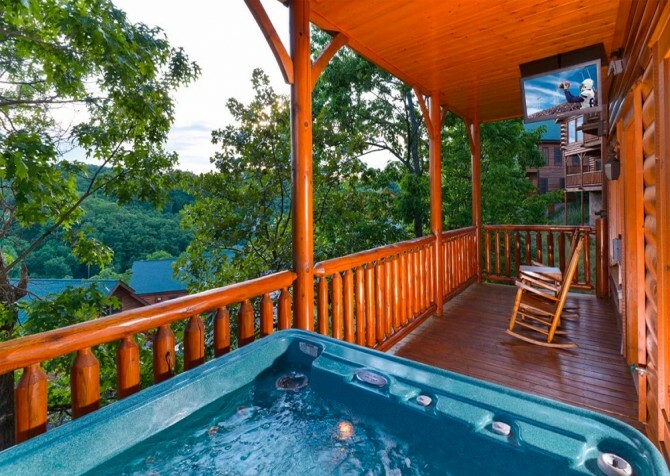 Vacation home amenities, including a hot tub, game tables, and indoor jetted tub, are paired with the conveniences of home at Little Smoky Hideaway. Curl up by the gas fireplace, fire up the charcoal grill, whip up meals in your fully equipped kitchen, or fall asleep watching TV in bed. An all-log cabin located in the Shagbark Community, Paul Bunyan's Treehouse offers access to a community pool for cooling off in the summer. 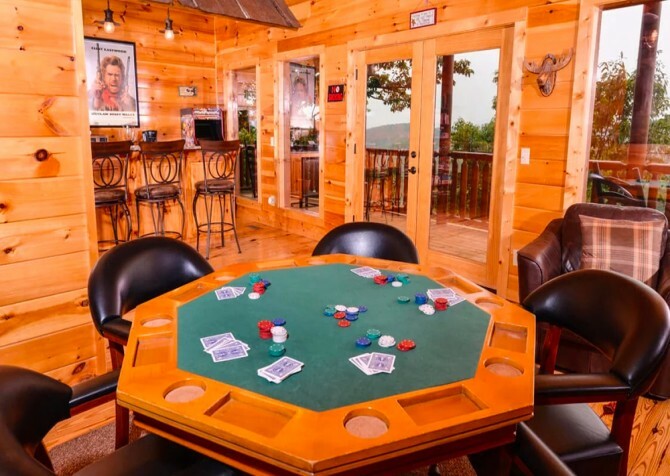 The 4-bedroom, 3-bathroom Pigeon Forge cabin sleeps 12 and boasts a pool table, big screen TV, and TVs in every bedroom. Also enjoy stylish decor, spacious interiors, and incredible blue mountain views from your mountain home! 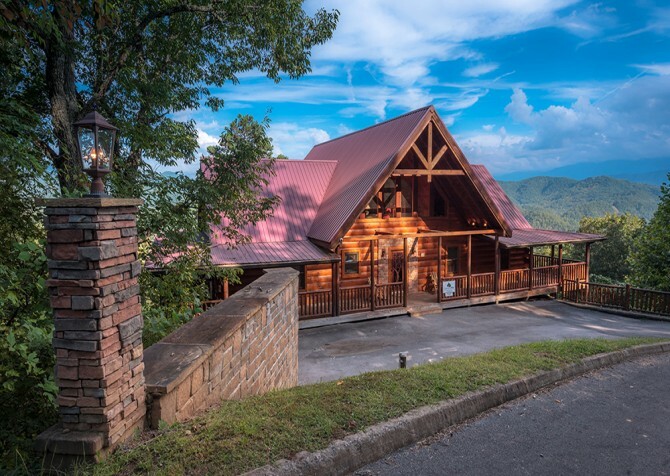 Boasting gorgeous views of the Great Smoky Mountains, this 4-bedroom cabin can accommodate up to 12 guests for a fun family or group vacation. Floor-to-ceiling windows create views from the dining area, living room, and kitchen, and the covered hot tub is a great place to relax. A spacious game room, high-speed internet, flat, paved driveway, and washer and dryer provide extra convenience. Just minutes from popular Pigeon Forge restaurants and attractions, Splash 'N Around makes it easy to enjoy the scenery of the Smokies without missing a beat of downtown fun. 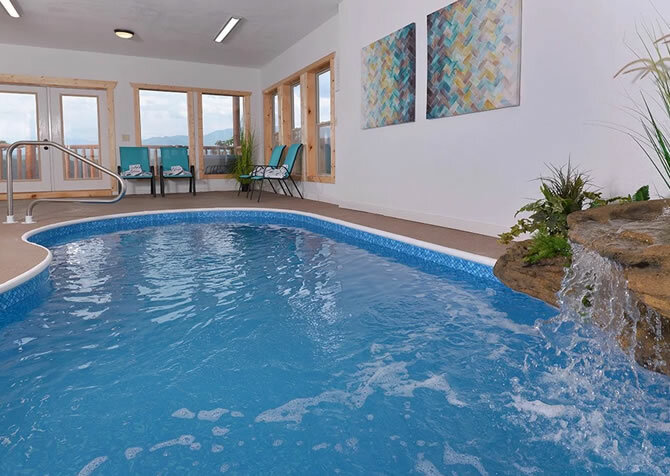 With more than 3,500 square feet of space, up-to-date amenities, and modern appeal, Splash 'N Around is a great choice for family vacations or small groups of friends wanting a blend of fun days and relaxing nights in the Great Smoky Mountains. 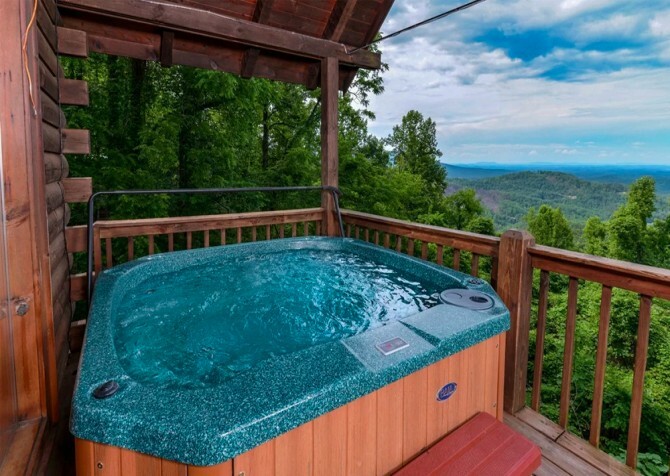 Located less than 5 miles to Pigeon Forge fun, Hilltop Plunge is a top cabin choice — with a private indoor pool! 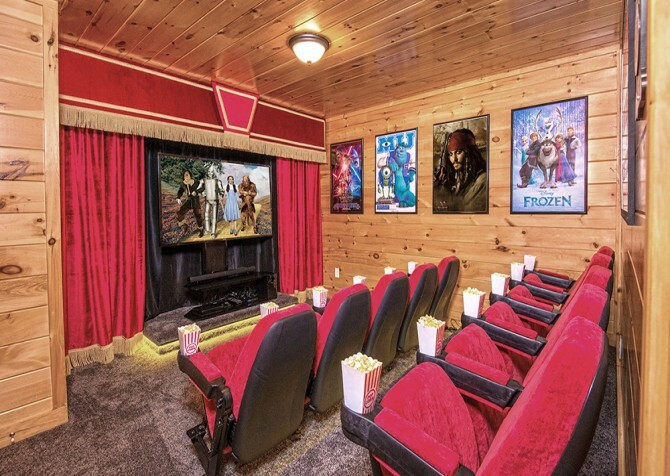 And that’s not all…this 3-bedroom, 4-bathroom cabin for 12 boasts big screen TVs, a Blu-ray player, a rec room with game tables and an arcade unit, snuggly king-size beds, an electric (heated) fireplace, and a nice view of Bluff Mountain. 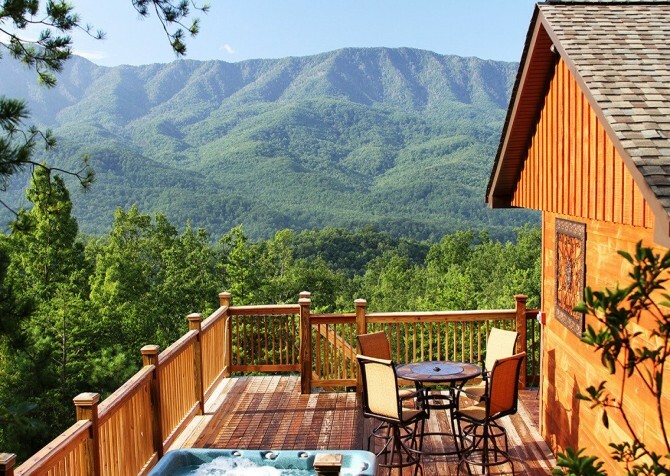 Stay tucked away in the Great Smoky Mountains yet only 7 miles to Pigeon Forge fun when you vacation at Legacy View! This 1-bedroom, 2-bathroom cabin boasts space for 8 guests, incredible mountain views, community pool access, games in the rec loft, an indoor jetted tub, a bubbly outdoor hot tub, a charcoal grill, free Wi-Fi…need we go on? 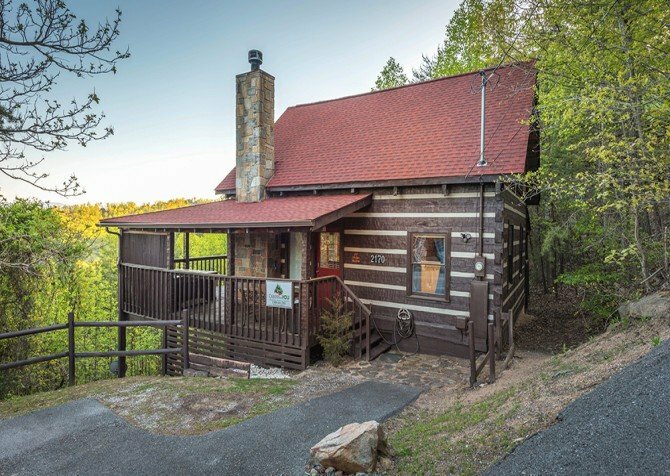 Around 13 miles to downtown Pigeon Forge fun, Absolutely Perfect is a 2-bedroom cabin for 8 nestled in the Great Smoky Mountains. Sip coffee with spell-binding views on deck, play games in the rec room, soak in the bubbly hot tub, whip up meals in the fully equipped kitchen, enjoy 2 big screen TVs, and paint the town red every night! 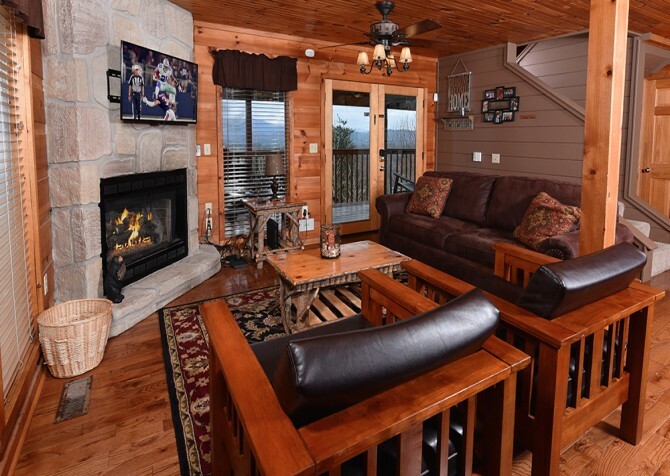 Great for groups, this beautifully built and designed 7-bedroom lodge in the Gatlinburg Falls Hidden Valley Resort boasts 3 levels of decks, a short drive to downtown, outdoor hot tubs with TVs, double kitchen appliances, 2 rec rooms, a theater room, and so much more! 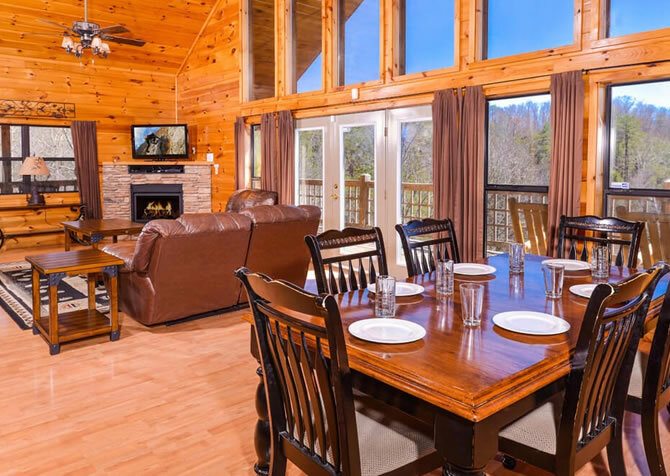 Get away with a group of up to 46 to this gorgeous large group cabin in Pigeon Forge. Each of the 8 bedrooms has its own heat and air conditioning controls, and the more than 7,000 square feet of space provides plenty of luxurious space for everyone. Along with soaring mountain views, enjoy comfortable interiors, a theater room for movie nights in the cabin, a luxurious kitchen, and a huge game room! 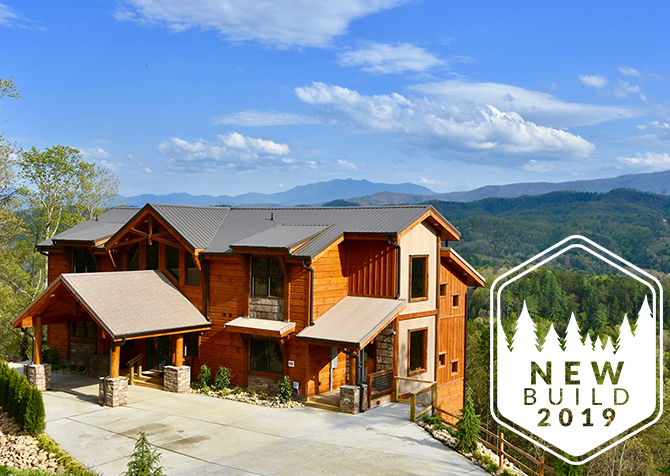 If you’re bringing a large group to the Great Smoky Mountains, check out one of our largest cabins, Summit View Lodge. 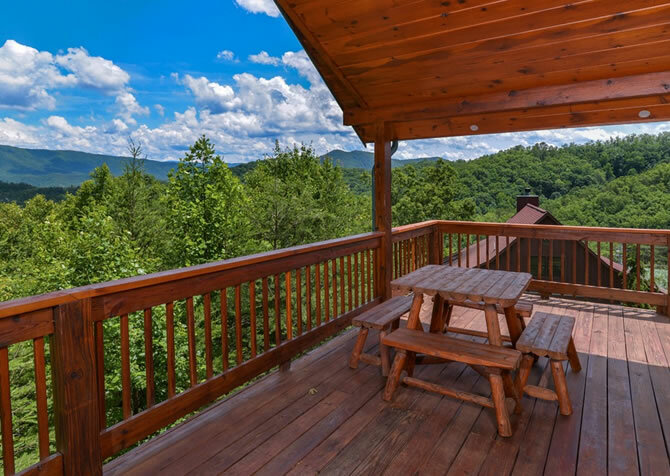 Seated high in the Smoky Mountain hills, this cabin offers impressive views and a long list of amenities for up to 30 guests. Enjoy a living room and family room, a dining room with seating for 20, a modern, fully equipped kitchen with double appliances, a loaded rec room, and more! A getaway in Pigeon Forge, Mountview Paradise is fit for reunions, retreats, and special occasions. Private indoor pool, movie theater, double appliances in the kitchen, 2 rec rooms, tons of deck space…this 12-bedroom escape has it all! 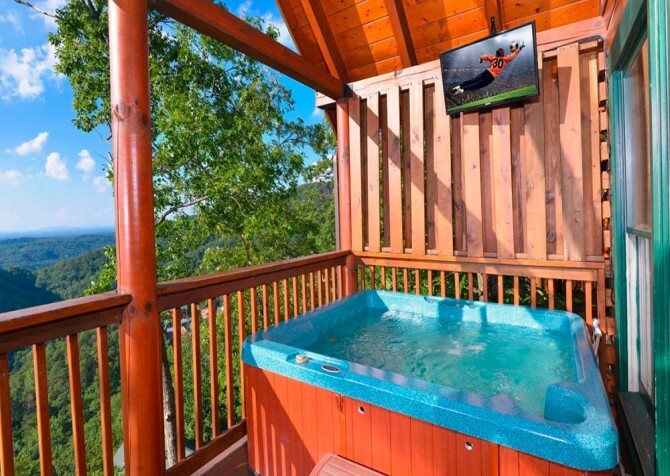 A gorgeous home in Pigeon Forge, Keaton’s Cozy Cabin boasts amenities for all to enjoy, from soaking in the outdoor hot tub to watching shows on the 4 big screen TVs. Enjoy a bottle of red from town at the outdoor dining table with a juicy steak fresh off the gas grill and take the fun up a notch by gathering in the media room for a movie or a game at night. Great for a family vacation or a small group getaway, Fitzgerald’s Shamrock Chalet is a 4-bedroom, 4.5-bathroom cabin with room to sleep up to 15 guests. This home offers lots of conveniences, games, TVs in every bedroom, mountain and wooded views, and much more. Plus, it’s only 5 miles from downtown Pigeon Forge, so you can head into town for games, shopping, and meals in a snap! Only 2.7 miles from downtown fun in Pigeon Forge, Slice of Heaven gives you a convenient location with tons of amenities everyone can enjoy. 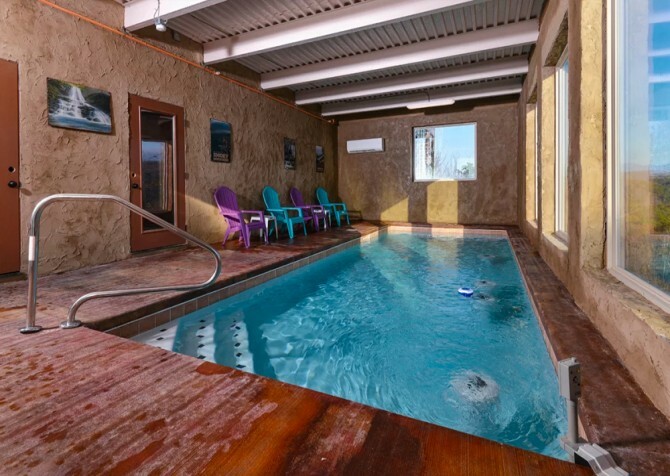 Splash in the private indoor pool, play pool, shuffleboard, and arcade games in the rec loft, watch feature films on the big screen in the theater room, doze off in a king-size bed, and wake up to majestic mountain views every morning. Play games in the rec room, chat by the stone (gas) fireplace, soak in the steamy hot tub outdoors, watch as wildlife soars across the mountains, and relax in the master suite’s indoor jetted tub before drifting to dreamland in a king-size bed at Homestead Hideaway — a 3-bedrooom, 3-bathroom cabin for 6 guests around 15 miles from in-town fun in Pigeon Forge, TN! 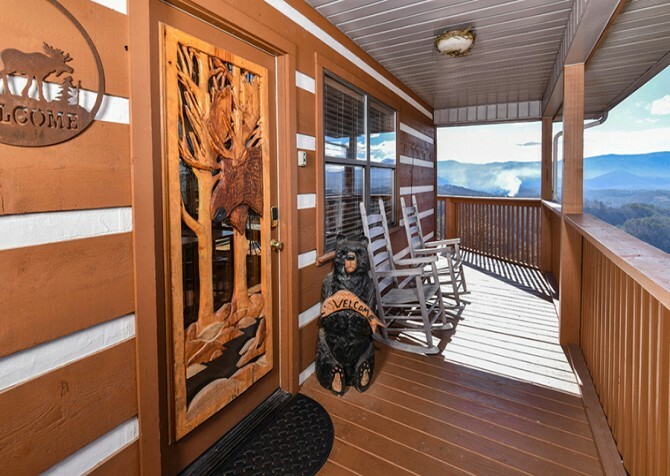 Boasting a convenient location, less than 5 miles to the heart of Gatlinburg fun, Eagle’s Nest offers local attractions, restaurants, and shopping within a reasonable drive. 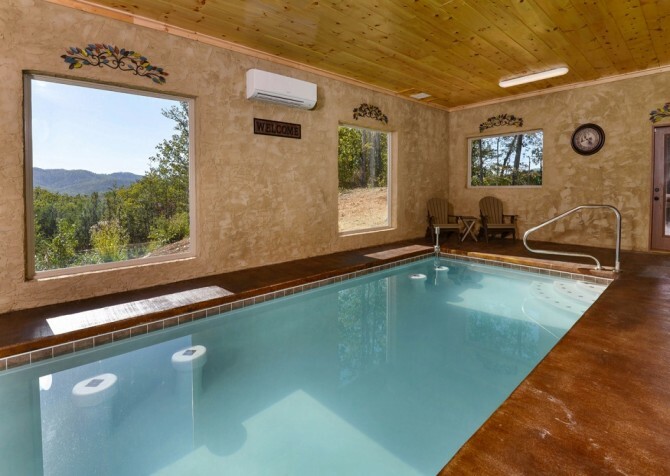 Plus, with incredible mountain views, a steamy hot tub, pool table and arcade unit, king-size beds, and a cozy fireplace, returning to your vacation cabin will put a smile on your face every evening. Boasting room for 14, this 3,500-square-foot cabin offers a private indoor pool with lots of great features, a relaxing outdoor hot tub, a cozy theater room for movie nights in, a fully loaded game room for hours of entertainment, and tons of options for relaxing in the great outdoors. If you’re wanting privacy and plenty of room to spread out, this 3-bedroom, 4-bath cabin is a great choice for you! 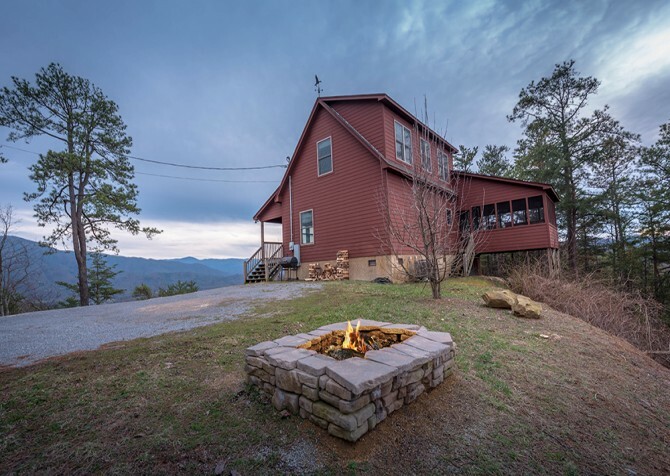 If you've been looking for a secluded cabin rental with a magnificent mountain view, this 2-bedroom cabin could be the one for you. A modern and updated interior complement the vast outdoor living space, including a covered deck and screened-in porch with card table and hot tub. Lounge by the outdoor fire pit or play a round of bumper pool with your kids on those peaceful nights around the cabin. 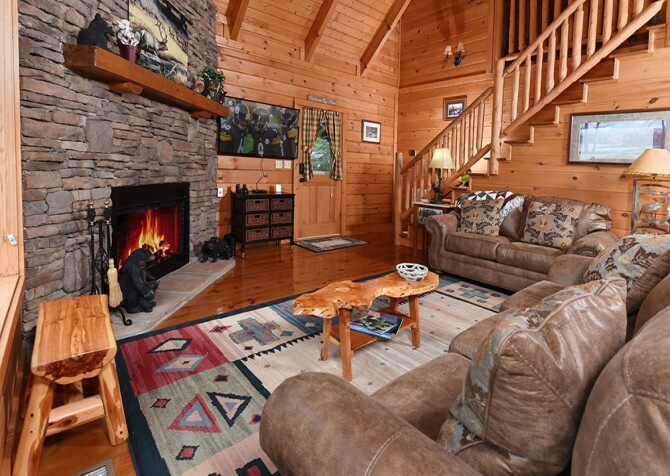 Awesome vacation amenities abound at this 1-bedroom, 2-bathroom Pigeon Forge cabin. Enjoy a fully equipped kitchen, outdoor hot tub, soothing indoor jetted tub, flat driveway, big screen TV and DVD player, foosball and pool tables, charcoal grill, and high-speed Wi-Fi. A TV in every bedroom is convenient, and pool access will provide even more entertainment in this loaded cabin! If your family or a small group of friends are looking for a cabin with plenty of space and tons to do, check out Patches Cabin! This 10-person rental offers 4 bedrooms and 3 bathrooms spread out over 2,000-plus square feet of space. 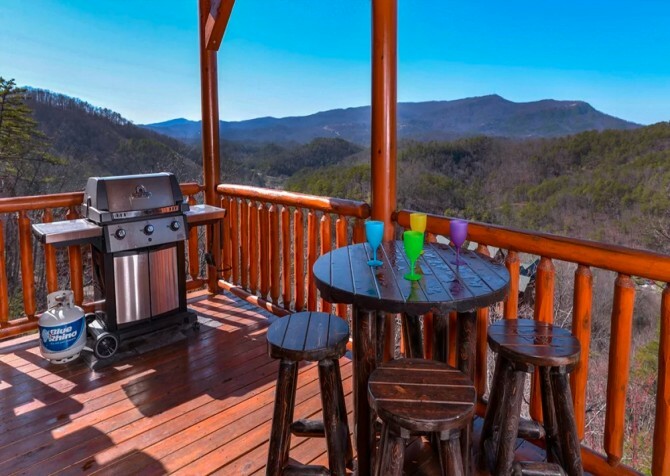 Enjoy multiple decks with mountain views, an outdoor hot tub, a picnic table, and charcoal grill along with easy access to downtown Pigeon Forge at Patches Cabin. 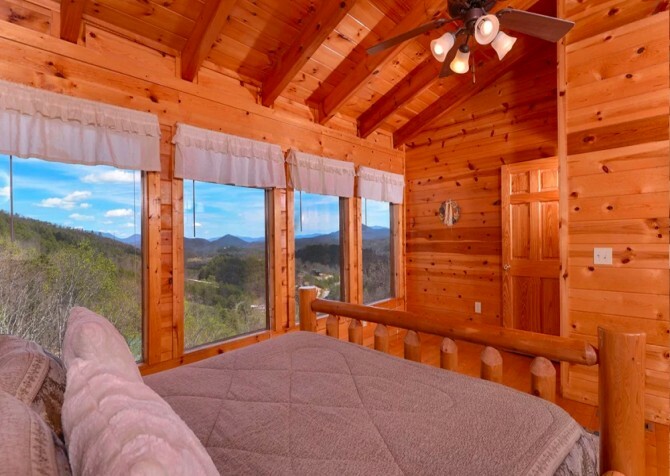 Romantic details and fantastic mountain views make this 1-bedroom cabin perfect for a honeymoon in the Smokies. 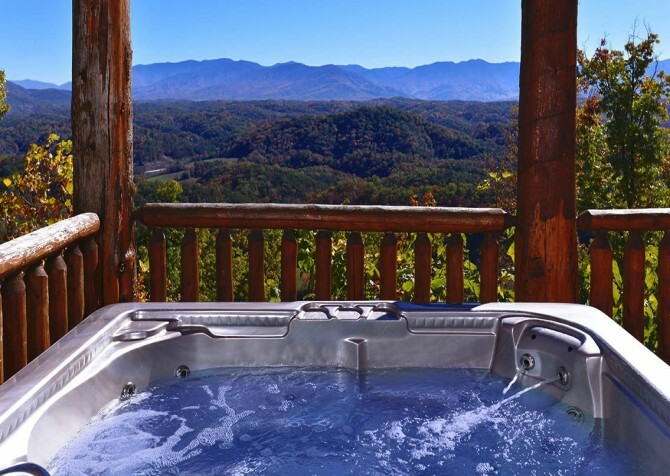 Take in the Smoky Mountain views from the hot tub, watch the leaves change in fall, or watch TV in bed. An indoor jetted tub and outdoor hot tub allow guests to unwind with a relaxing soak, and an ice bucket by the bed is ready for chilling champagne. The mountain views from this semi-private 1-bedroom cabin are truly awe-inspiring. You can take in the views from the decks, bedroom, kitchen, and living area! Simply adding to its appeal, A Luxury View also boasts pool and golf course access, foosball and pool tables, a hot tub, a charcoal grill, a TV in the bedroom, high-speed internet, and a big screen TV with DVD player! 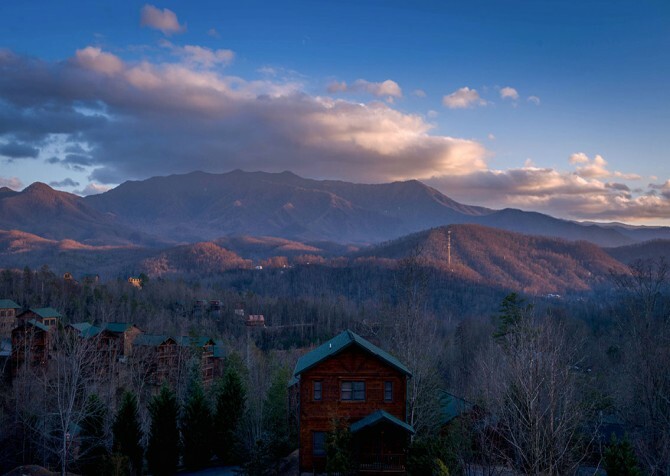 Stunning Smoky Mountain views await at Smoky View with a Twist. 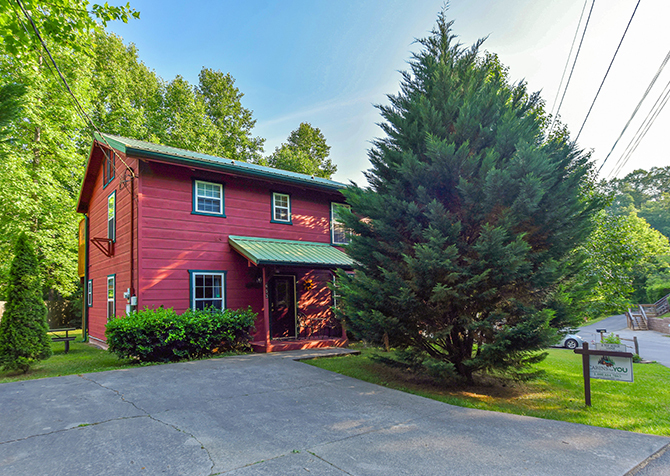 Located in Pigeon Forge, this large-group cabin is perfect for keeping close to nature within driving distance to local attractions and outdoor activities. Spend mornings on the back decks with a cup of coffee, afternoons shopping in town, evenings in the outdoor hot tub, and nights with a film on the big screen TV. 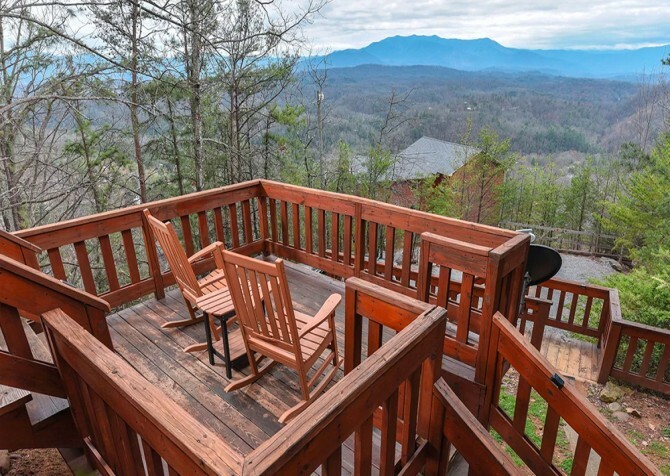 Located in the Mountain Shadows Resort, this beautiful cabin boasts gorgeous views, a short drive to downtown Gatlinburg, and lots of amenities. Gather at the dining table for family meals, relax in the rocking chairs, or soak in the hot tub on the deck, or kick back in front of the big screen TV in the living room. 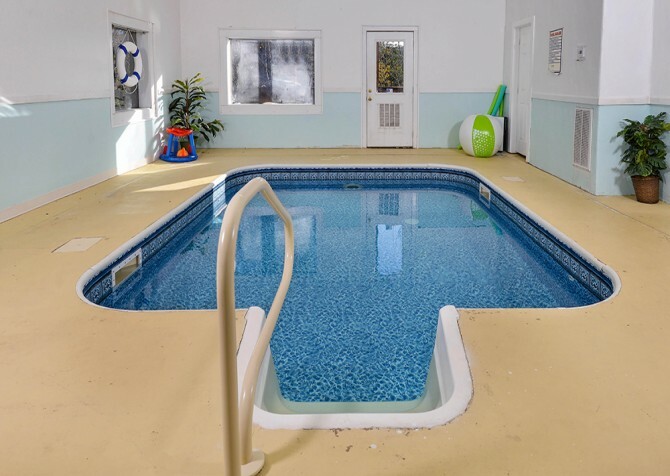 Bear Tracks also offers free long distance, pool and clubhouse access, and a picnic area! 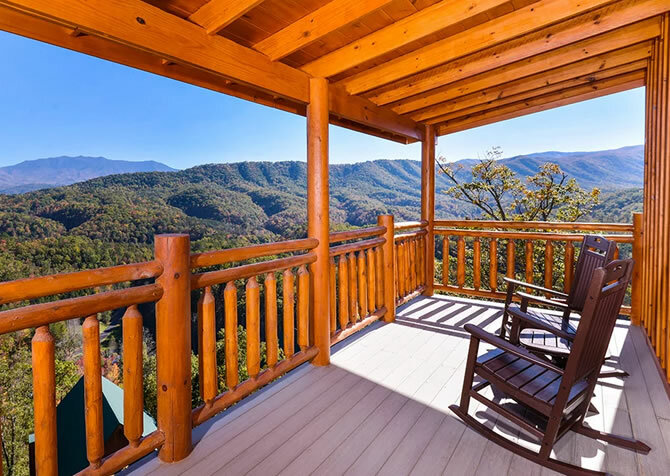 The mountain surroundings add to the magic of any special occasion in this 2-bedroom, 3 ½-bathroom cabin in Pigeon Forge. 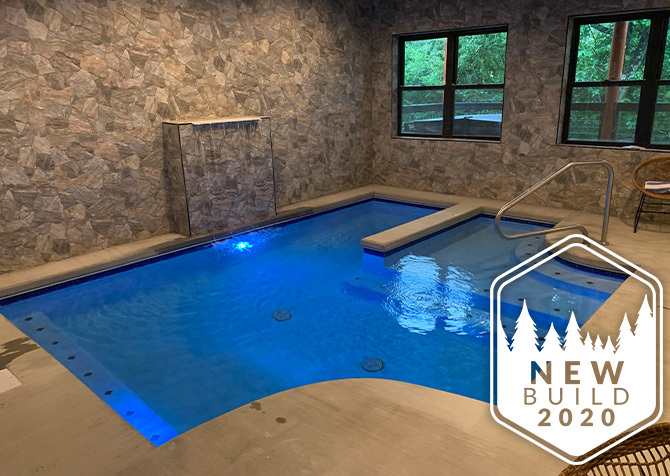 Relax with friends in the hot tub, play pool in the loft while you reconnect with the ones you love, or splash around in your private indoor pool with stone surround and fun water features! It's a cabin made for kids and adults of all ages! 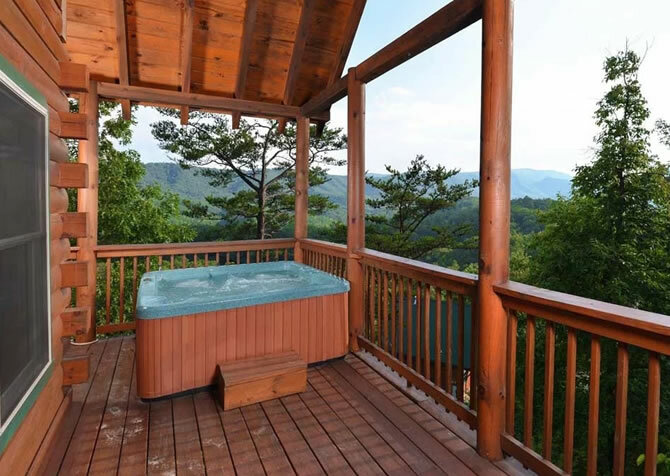 Flatscreen TVs in the bedrooms, an indoor jetted tub, and an outdoor hot tub will leave guests feeling relaxed and pampered in this 3-bedroom, 2 ½-bathroom cabin in Pigeon Forge. The cozy indoor spaces feel like home, and the many amenities offer convenience and fun. Other conveniences include a washer/dryer, charcoal grill, DVD player, and a location less than 5 miles from downtown. Invite your family or a large group of friends for a fun and relaxing stay at Jennie’s Cove. This 3,600-square-foot pet-friendly cabin not only features plenty of space—including 6 bedrooms with en suite bathrooms—but also game tables, a home theater, and a private indoor pool! 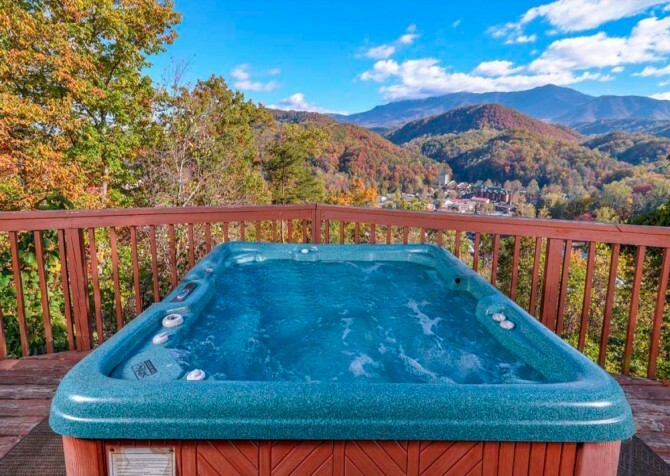 Enjoy all this plus mountain views, an outdoor hot tub, and an easy drive to Pigeon Forge when you book your stay at Jennie’s Cove. Savannah Splash is within miles of all your favorite group attractions in Pigeon Forge, but even if you never leave your driveway, you’ll enjoy game tables, an outdoor hot tub, a home theater, a private indoor pool, and more! 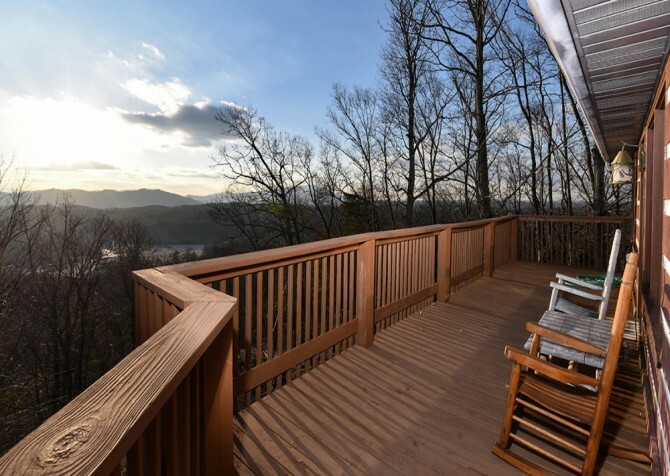 Savannah Splash even offers mountain views from 4 levels of covered decks. Get ready for a relaxing and fun-filled stay at this small group cabin for 12 that's also pet friendly. Sleeping up to 44 guests, this 14-bedroom Pigeon Forge cabin is great for a corporate trip or family reunion. 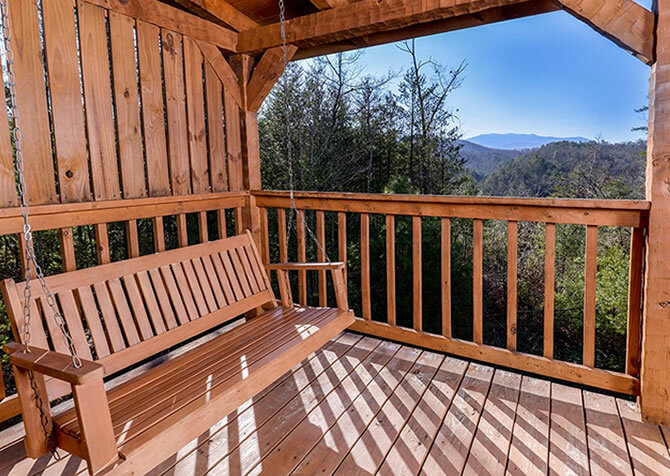 Located high in the mountains, this cabin offers a breathtaking view of Mount LeConte from the large deck. An array of windows frame the view, while double appliances in the full kitchen make it easy to prepare a meal for everyone. Play on the game tables or lounge in the living areas on a quiet night. 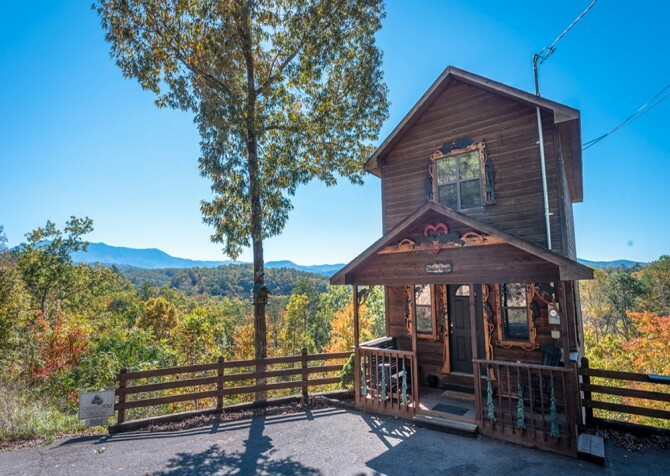 Located near downtown Pigeon Forge, this 2-bedroom, 2 1/2-bathroom cabin features a beautiful master suite, a spacious rec room with pool table and Atari, and incredible views of the Great Smoky Mountains. Feel at home in this more than 2,500-square-foot space with tons of amenities and cozy rooms after days shopping, eating, and playing in Pigeon Forge and Gatlinburg! 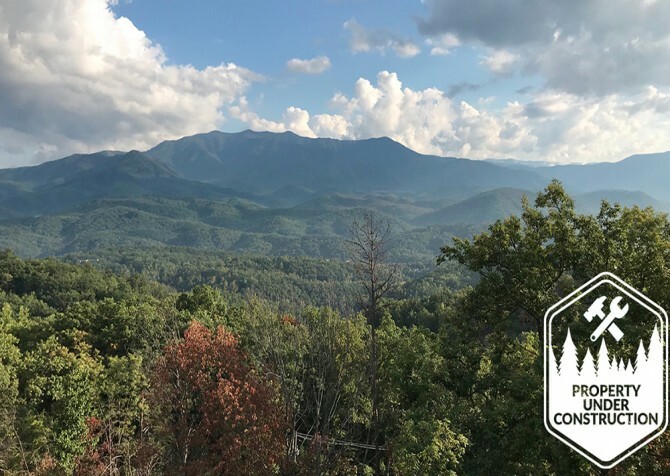 Located about 10 minutes from the heart of Pigeon Forge, Smoky View Straight Up keeps you close to the city without losing the feel of the mountains. Spend the day shopping and playing in town, then return to the cabin for a homecooked meal, game tournament in the rec room, movie night on the big screen TV, and an evening soak in the hot tub. Majestic Mountain Waters is a beautiful 8-bedroom cabin with 8 bathrooms and room for 30 guests. 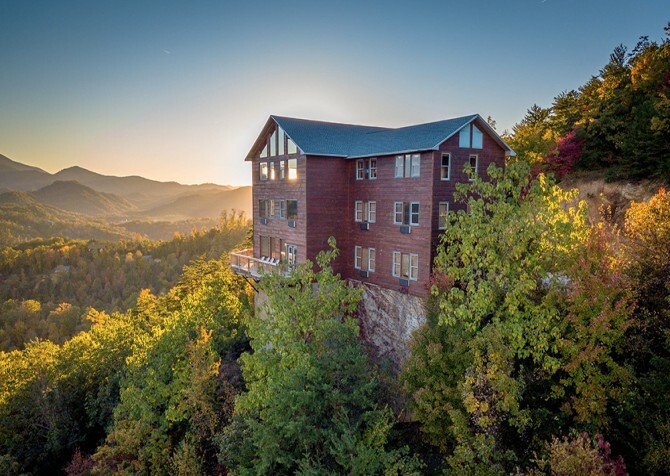 It features cozy king-size beds, bunk beds for groups, TVs in the bedrooms, a theater room, a private indoor pool and stunning views of the Smokies. It also boasts a rec room with a pool table, air hockey table, flatscreen TV, and arcade games - plenty to keep everyone entertained! 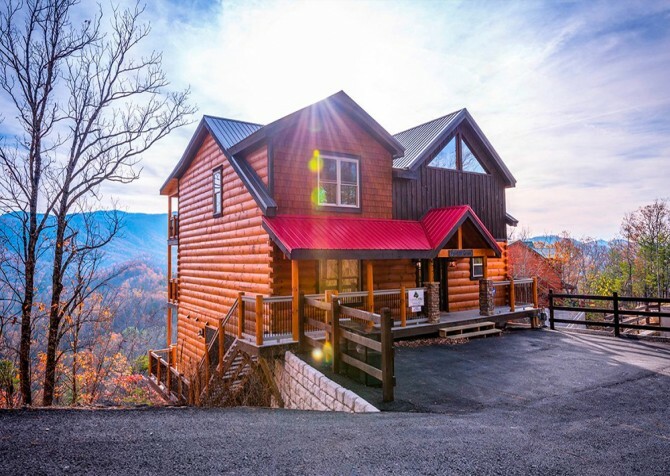 A little over 12 miles from Pigeon Forge is Sweet View Springs, a 14-person cabin with 3,700 square feet of space - enough for family and friends. Enjoy 4 bedrooms, 5 bathrooms, and modern amenities for your small group retreat. These include game tables, big screen TVs, an outdoor hot tub, and a private indoor pool where you can swim and splash year-round!